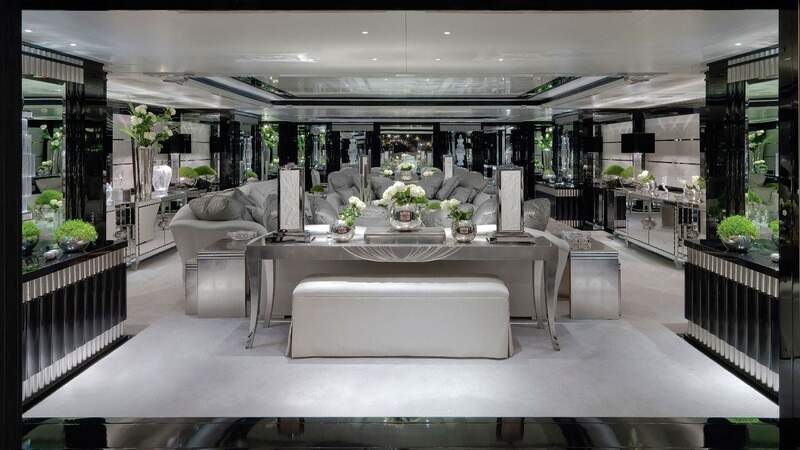 M/Y SILVER ANGEL is a large 64,5-meter steel Benetti luxury motor yacht designed by Stefano Natucci with an amazing interior by Argent Design of London. 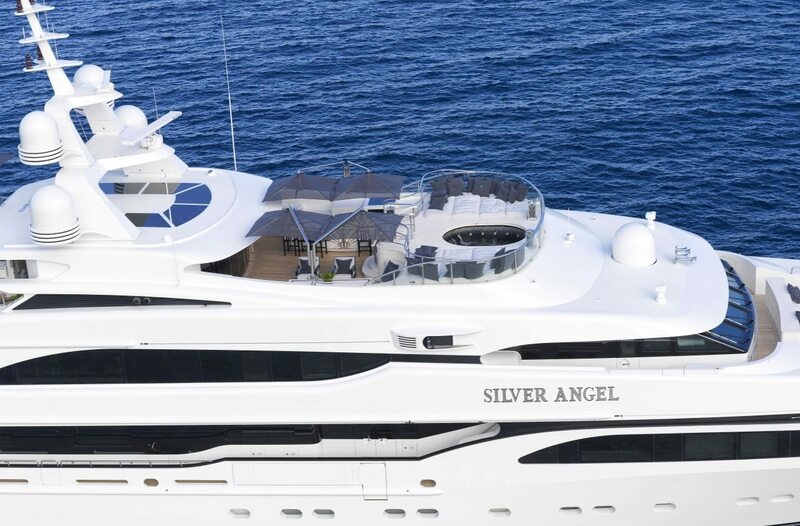 SILVER ANGEL was launched in 2009, and she is an extraordinarily high quality, well designed, spacious and stable luxury yacht which will leave you wanting for nothing. 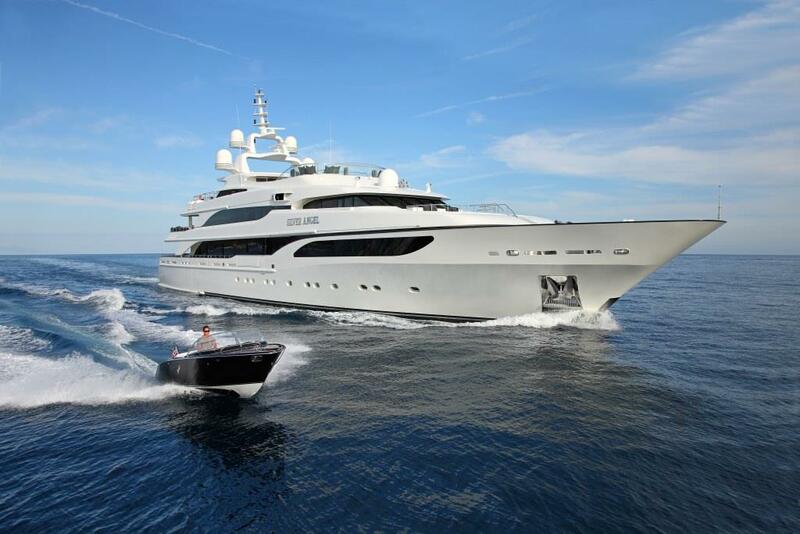 The vessel received a substantial refit in 2014/2015. 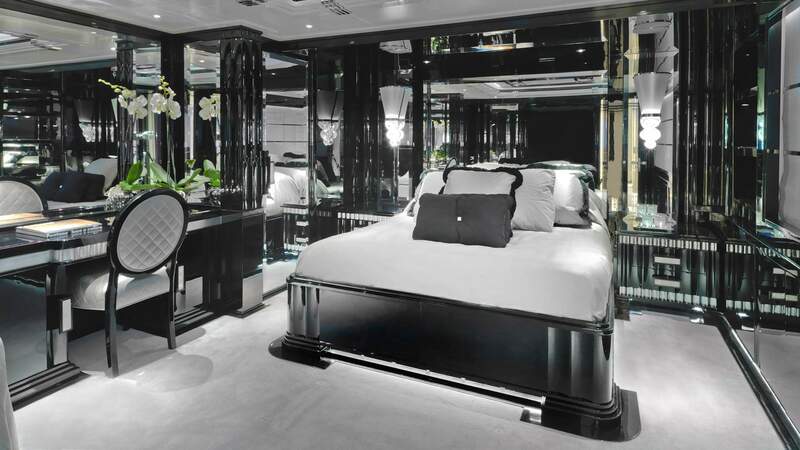 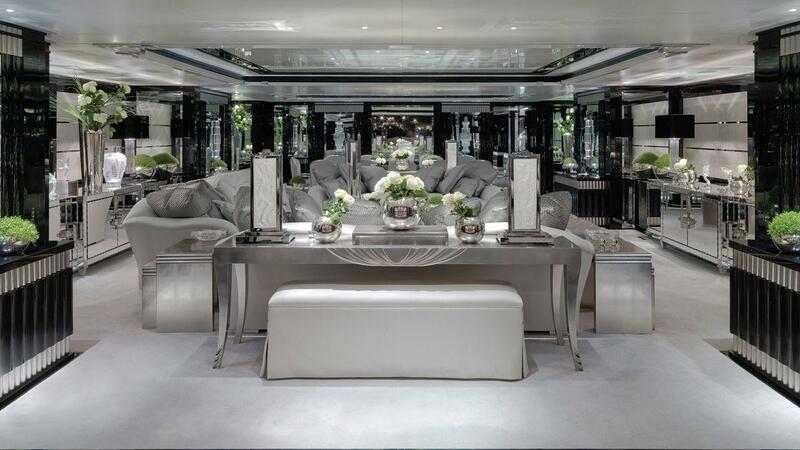 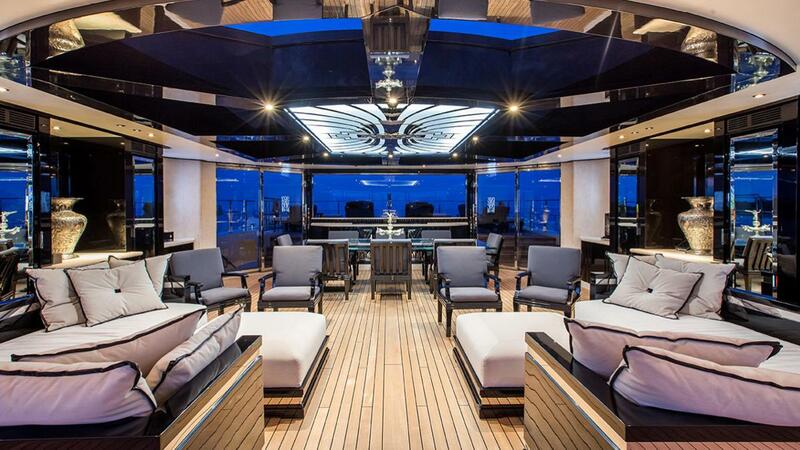 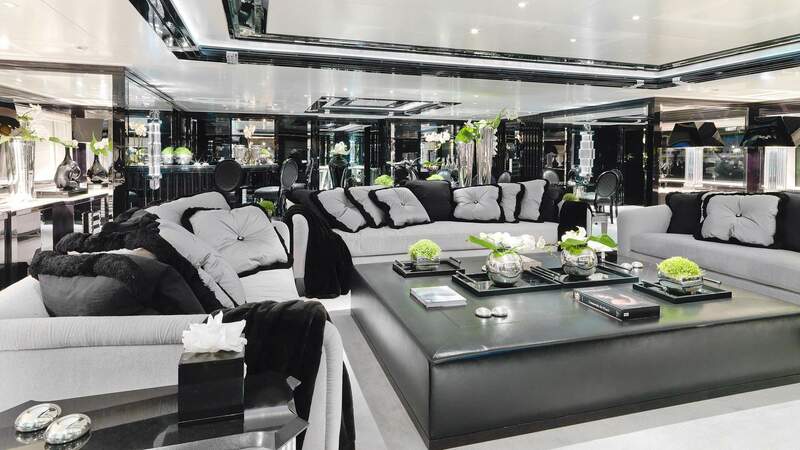 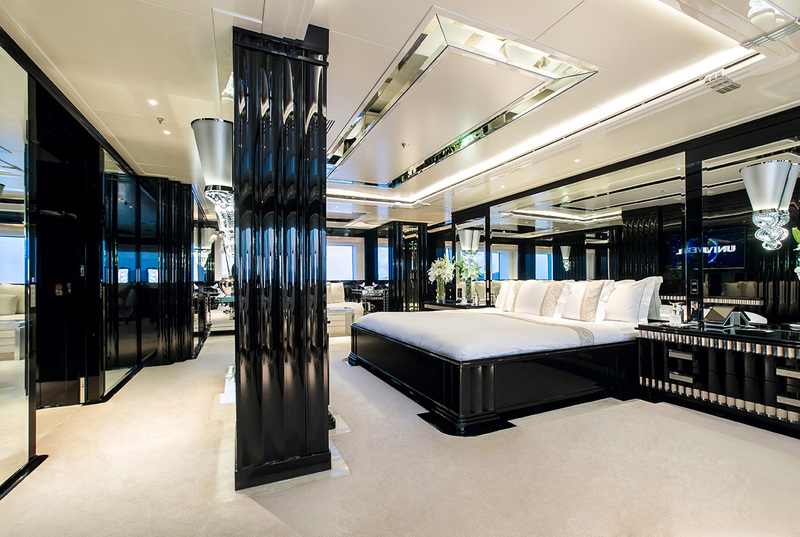 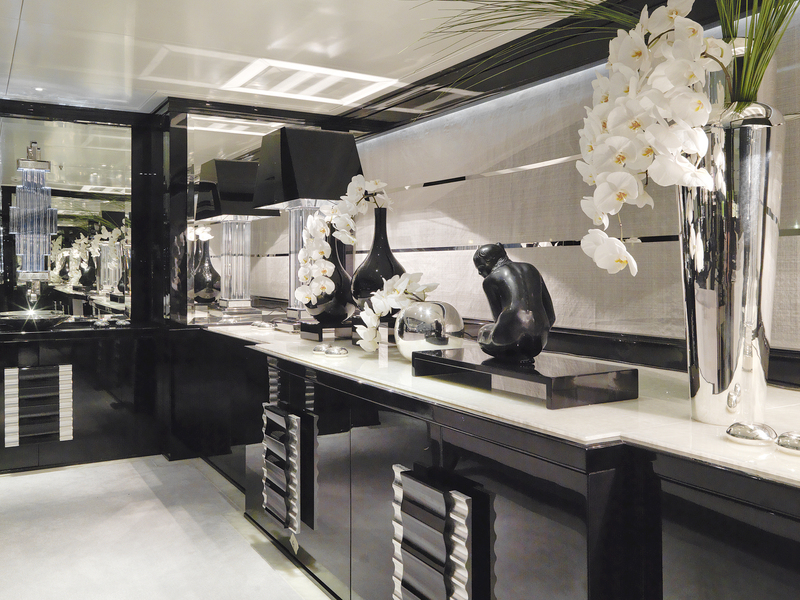 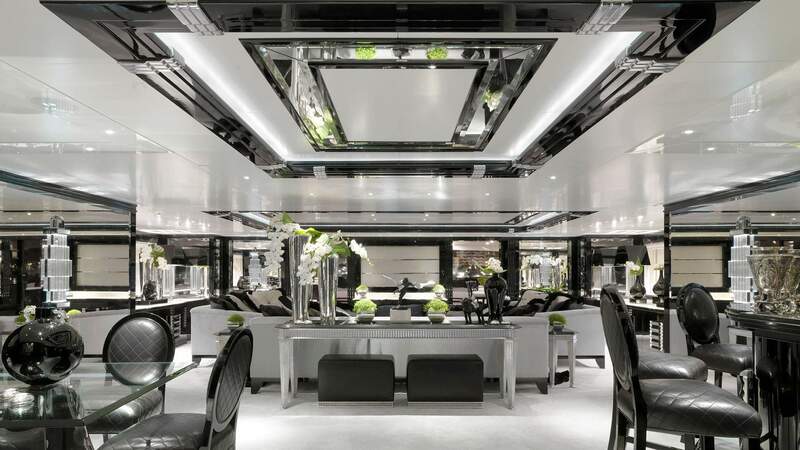 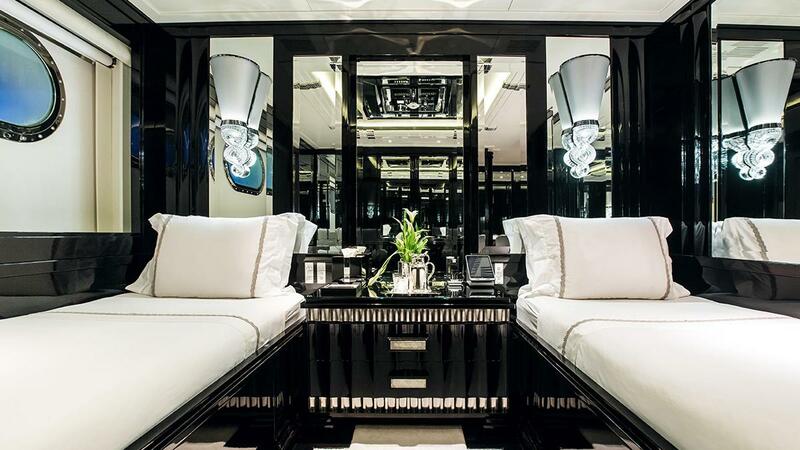 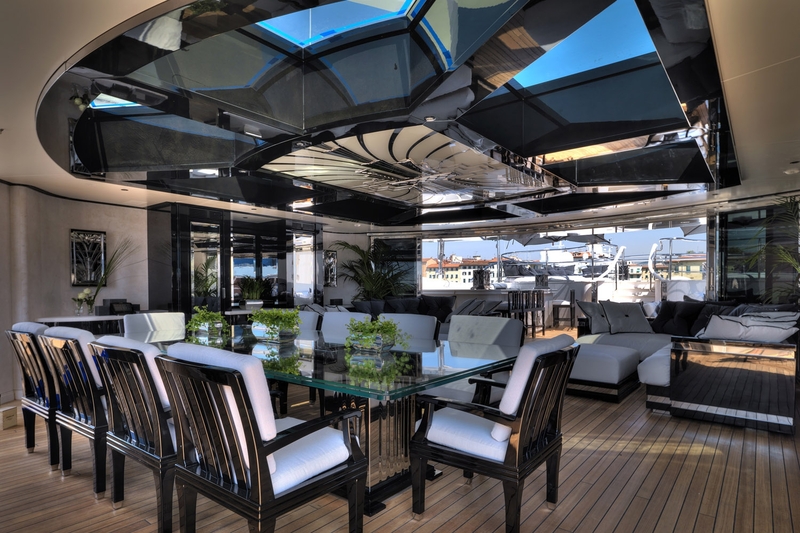 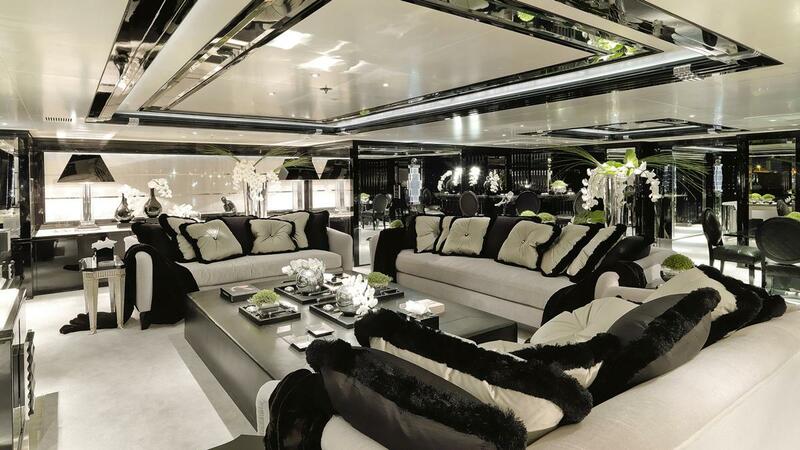 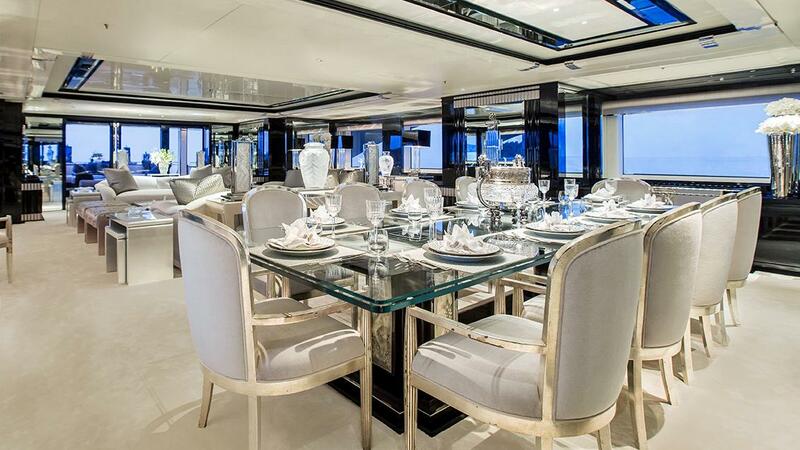 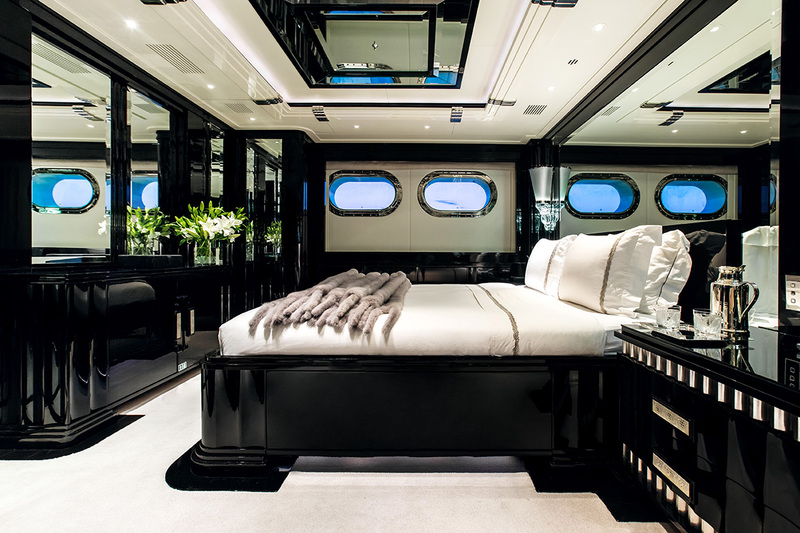 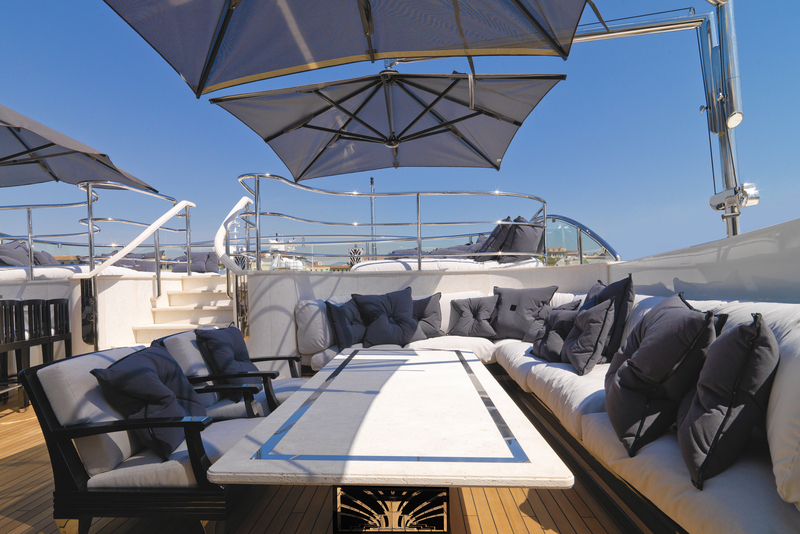 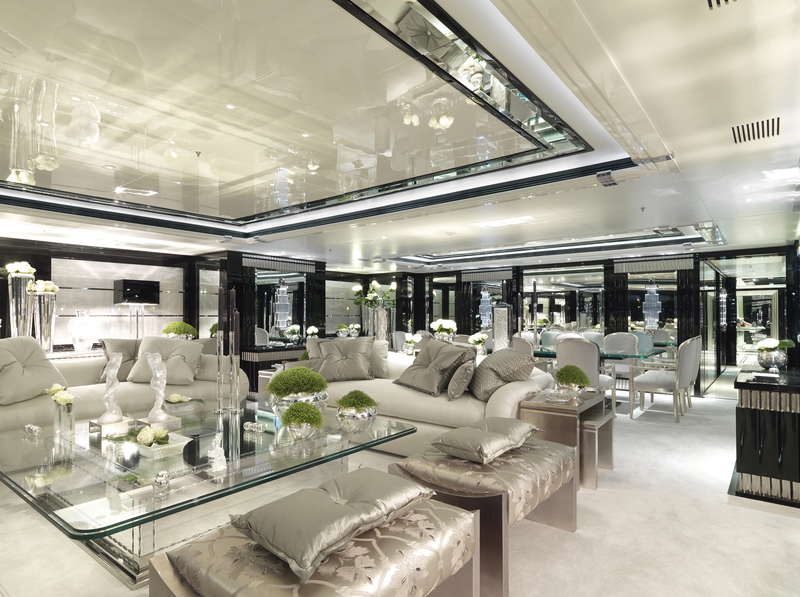 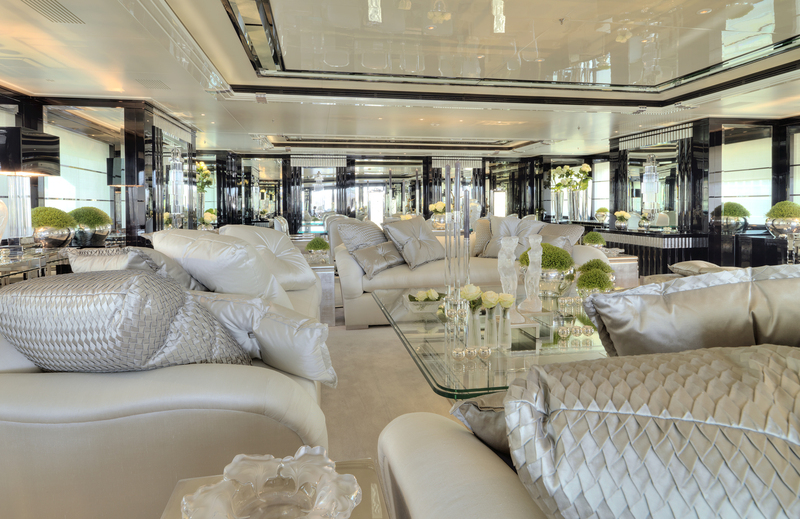 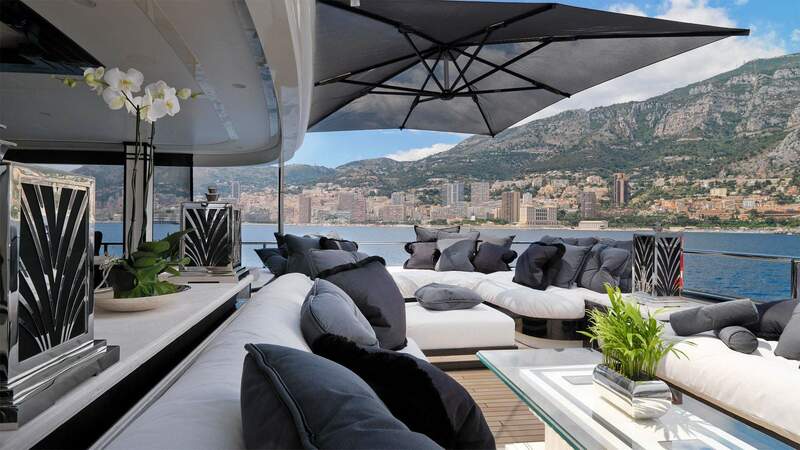 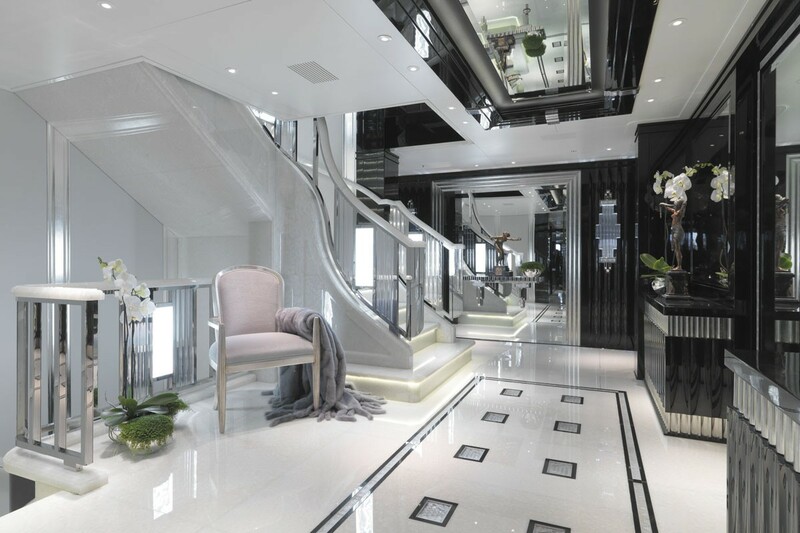 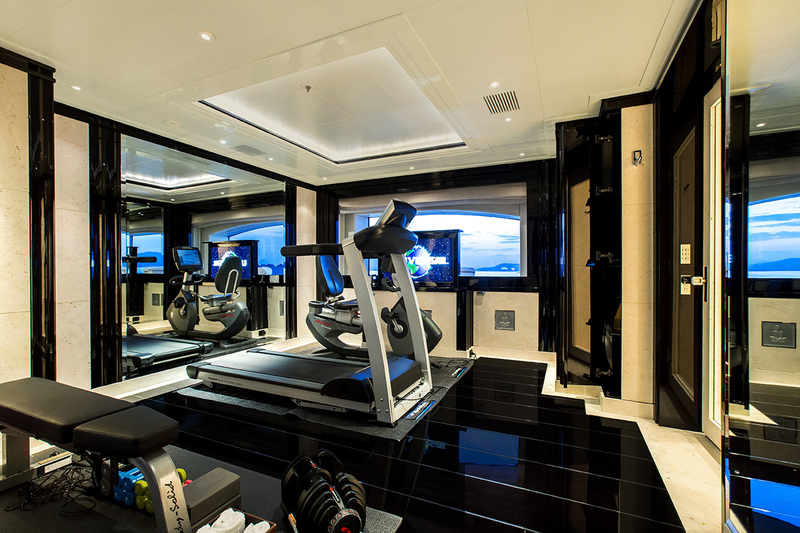 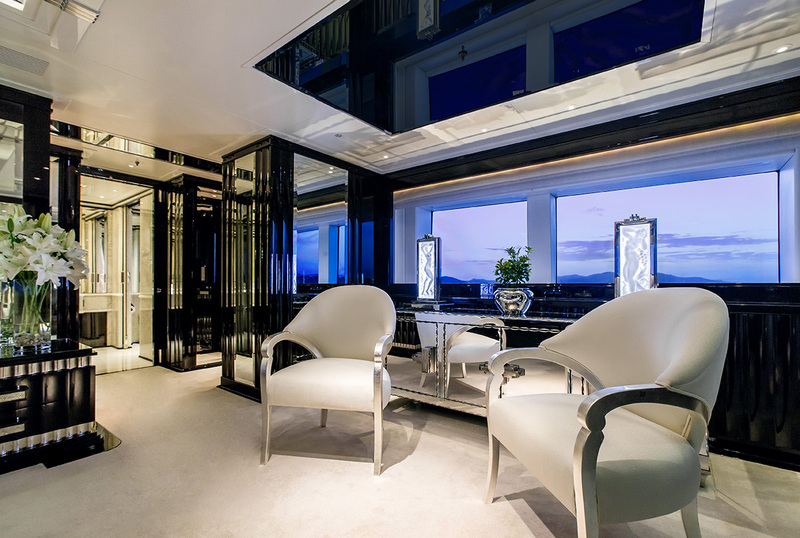 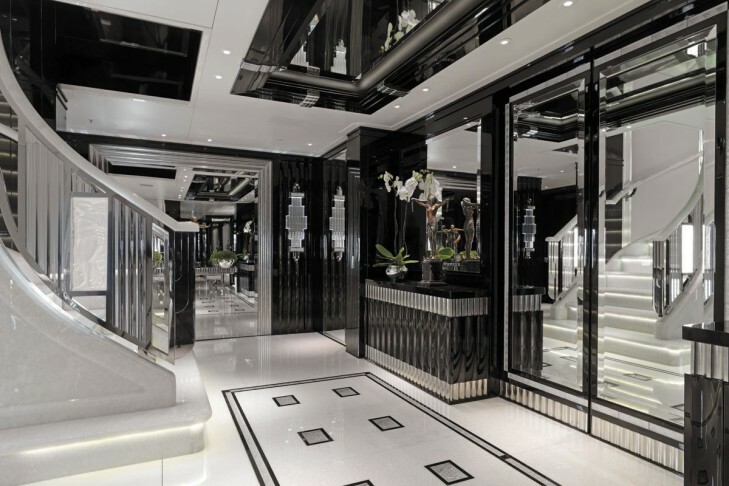 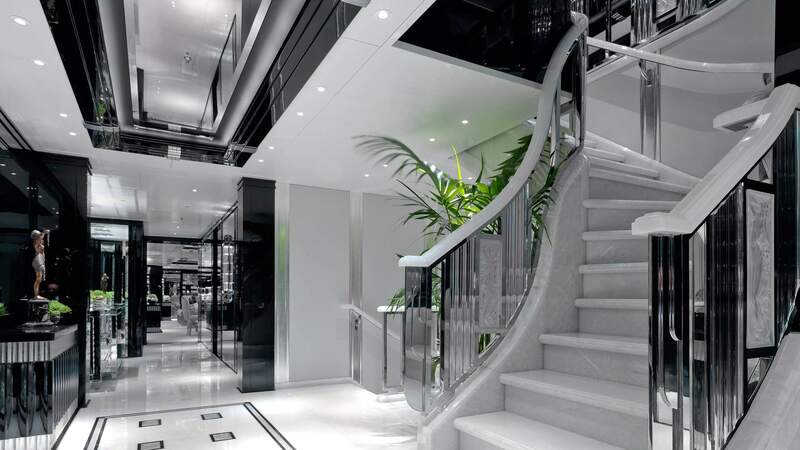 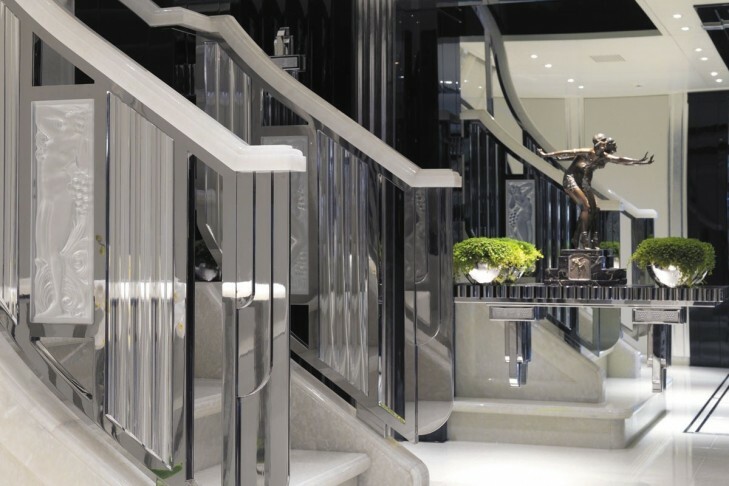 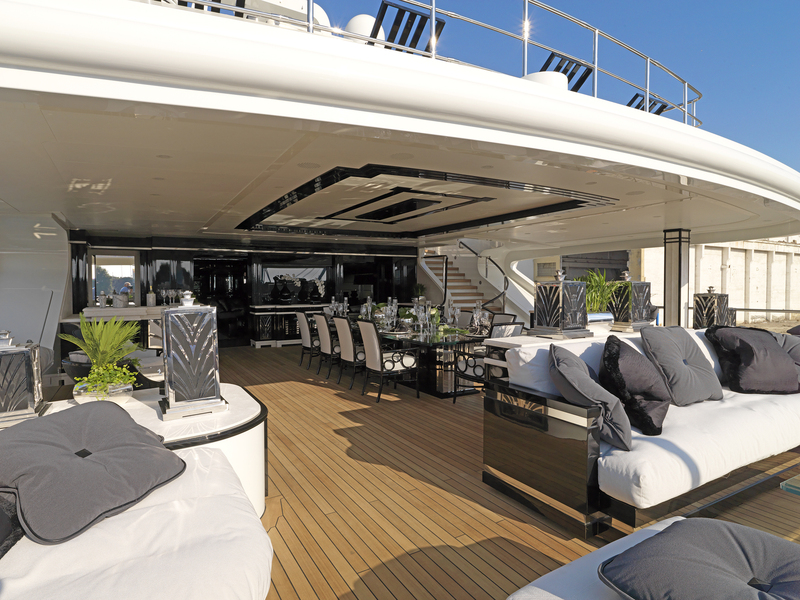 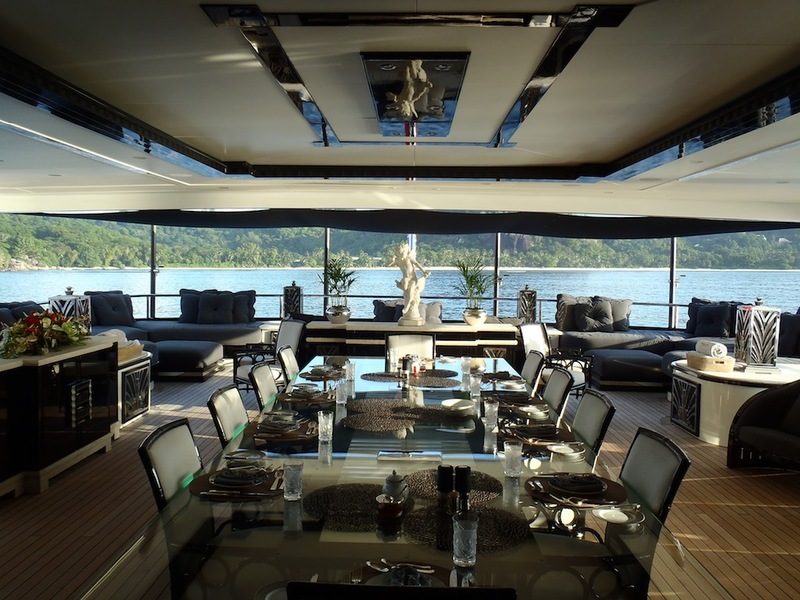 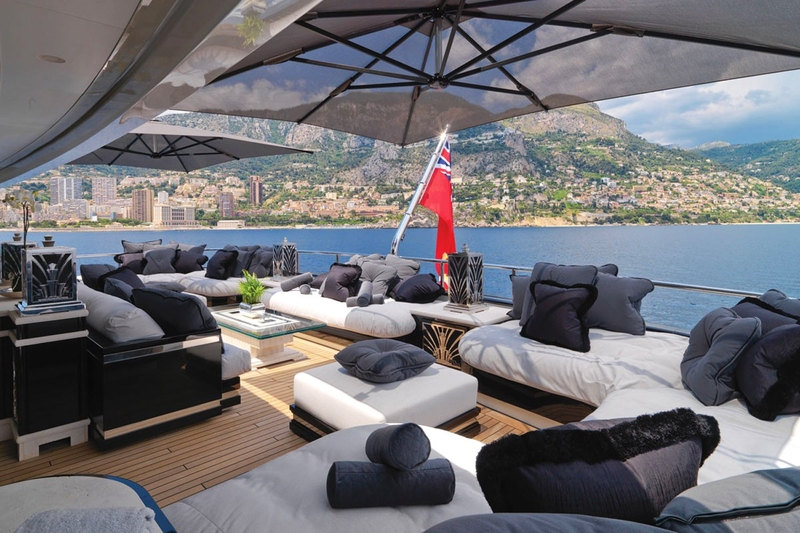 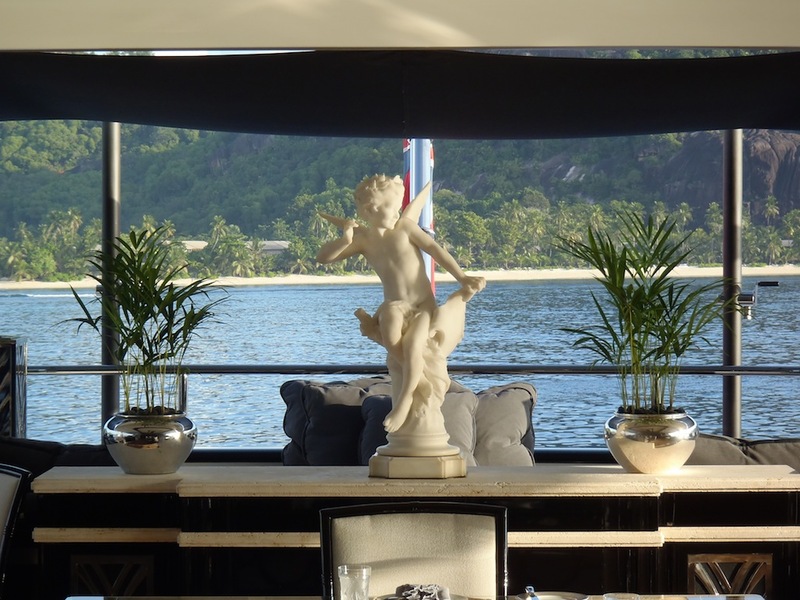 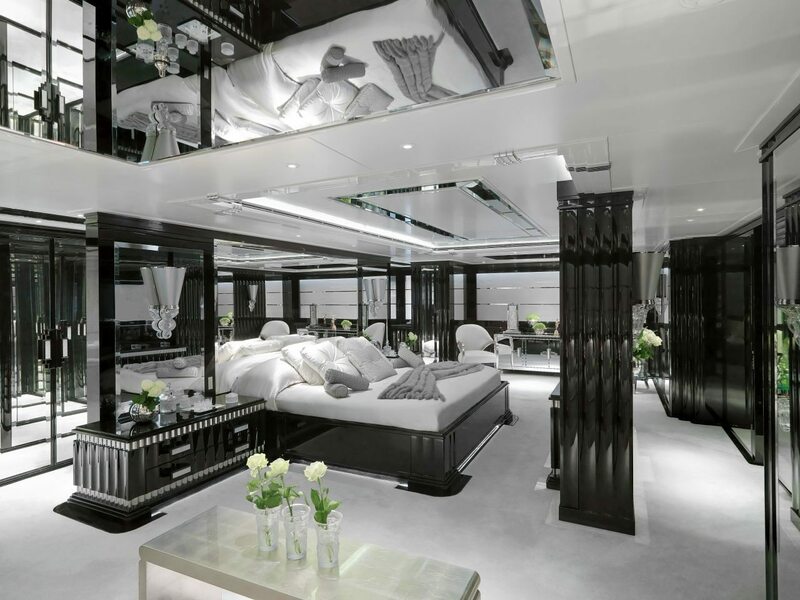 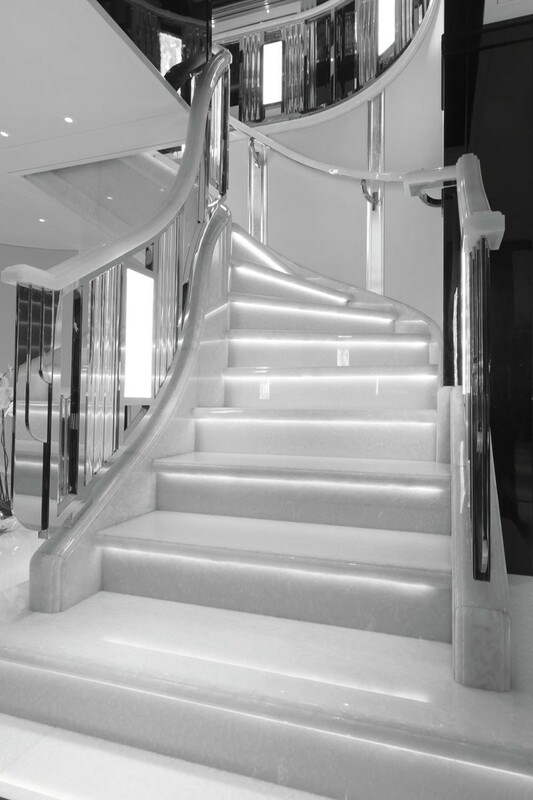 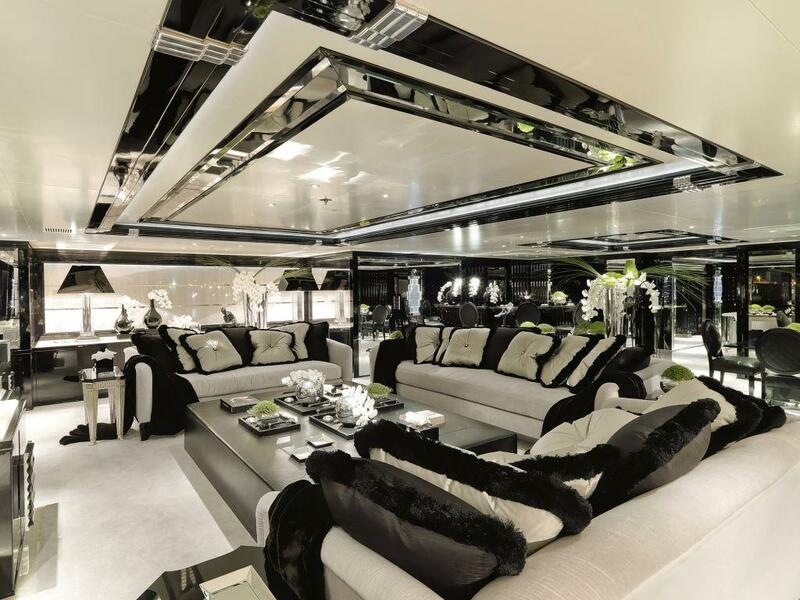 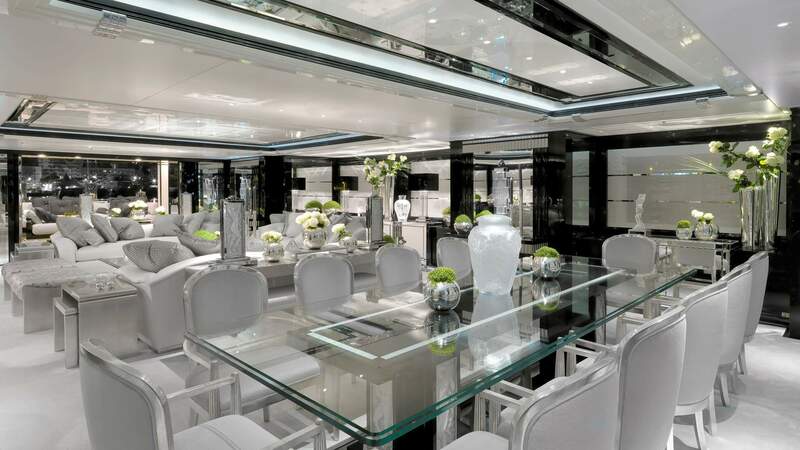 Motor yacht SILVER ANGEL’s unique and inspired interior design, which was accomplished by Argent Design in conjunction with Stefano Natucci, features themes of silver echoing her name. 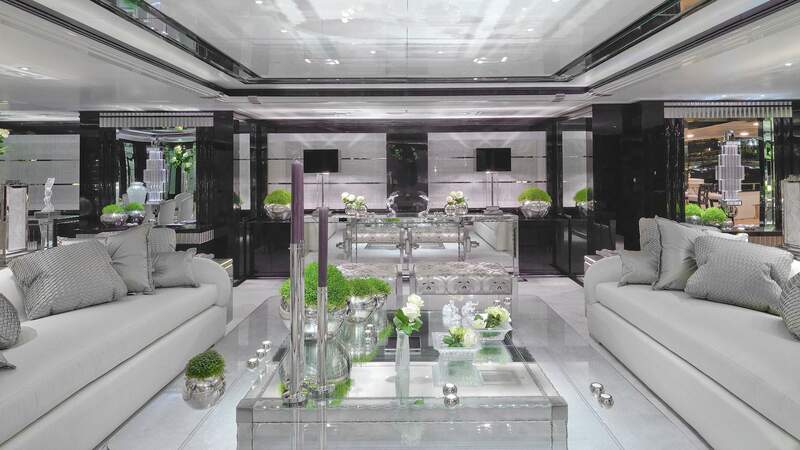 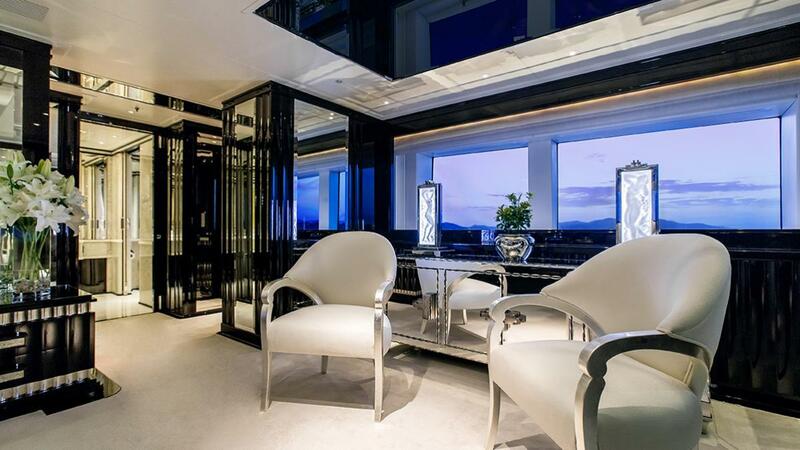 The interior reveals a high gloss dark oak paneling and built-in furniture which is superbly complemented by the radiance of white Onyx, silver leaf and carved mirrored units. 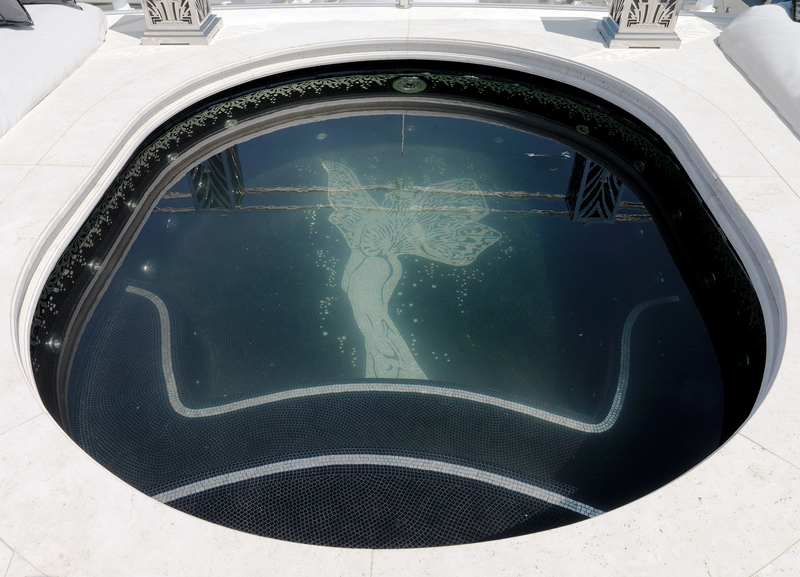 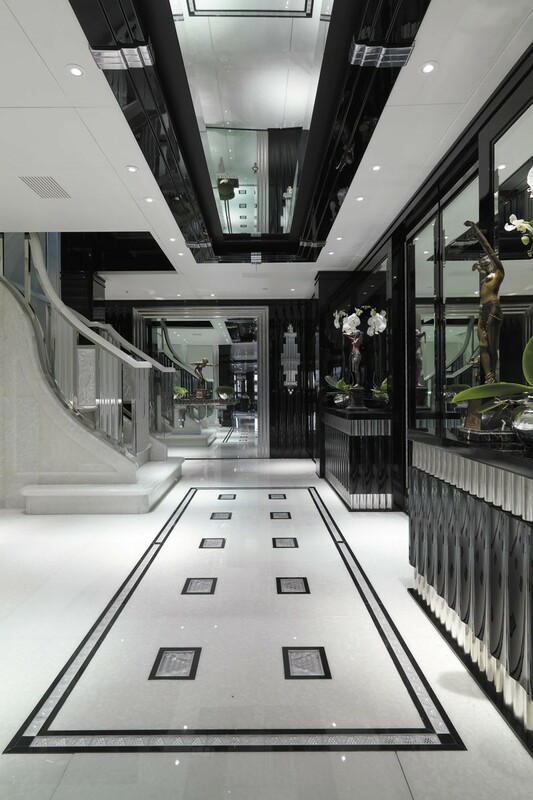 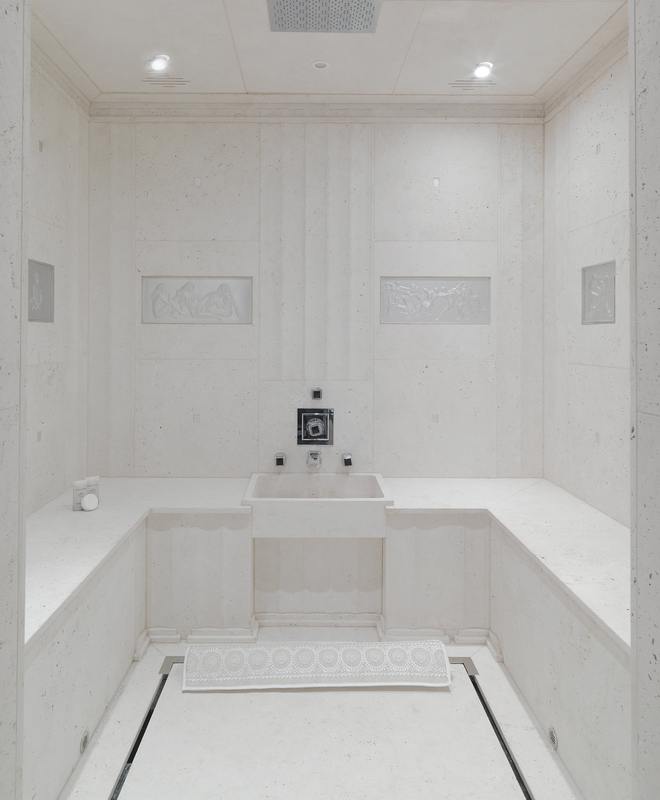 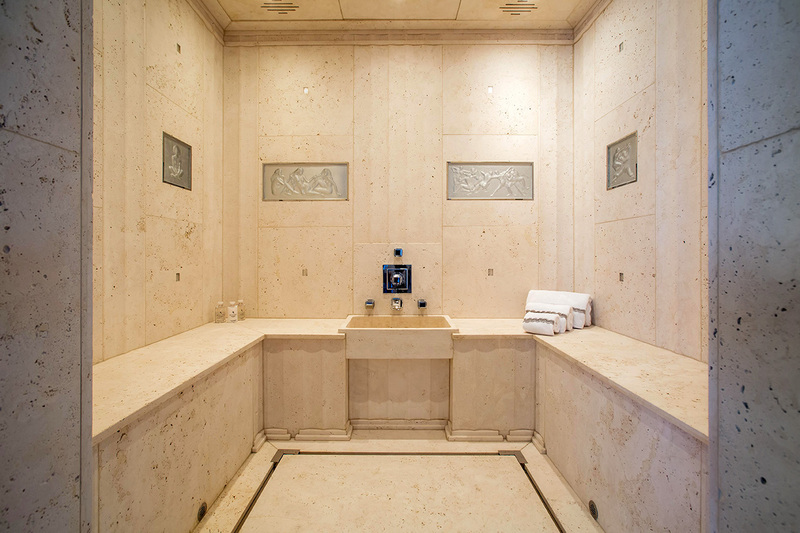 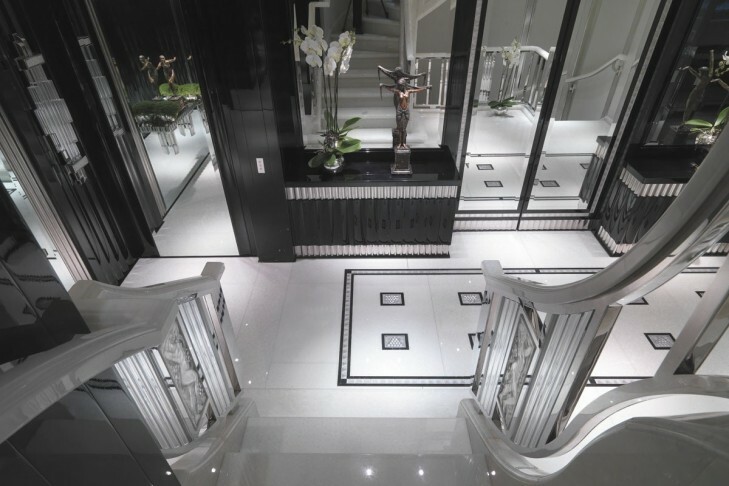 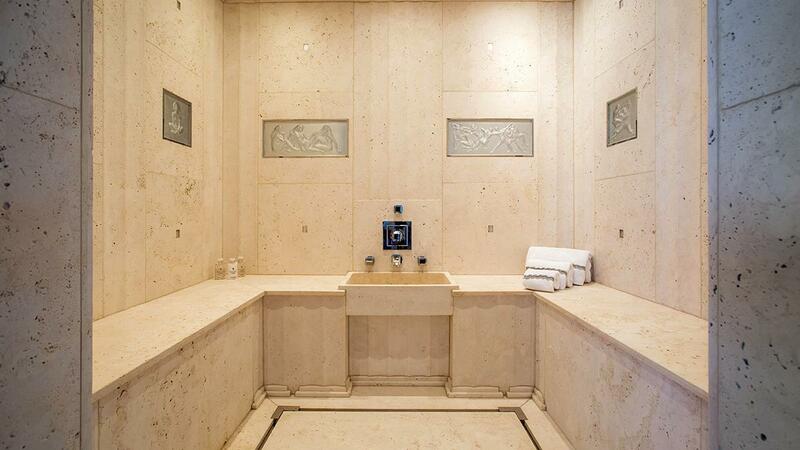 Around 1,200 square meters of glossy black oak and 700 square meters of marble with fine white onyx for the interior and travertine for the external areas have been utilized in her construction. 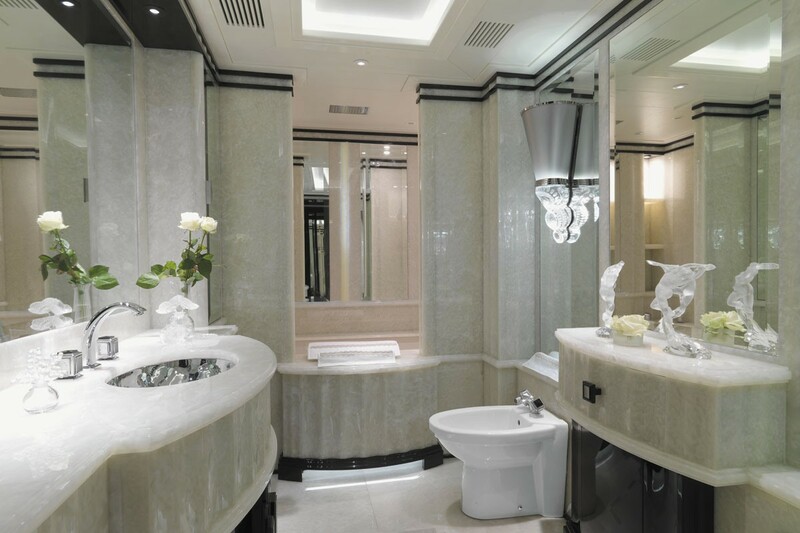 Custom built “Lalique” inserts with subtle back lighting have been used throughout guest areas, creating a uniquely stylish and tranquil atmosphere. 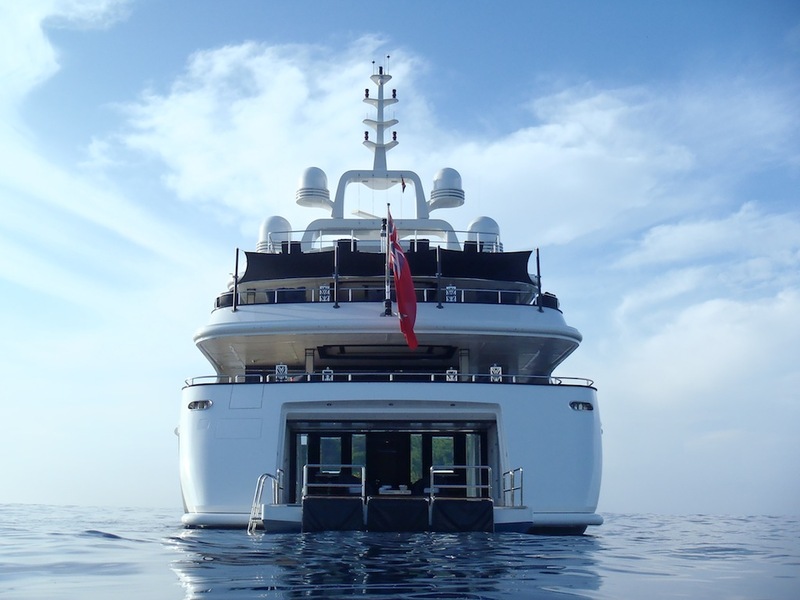 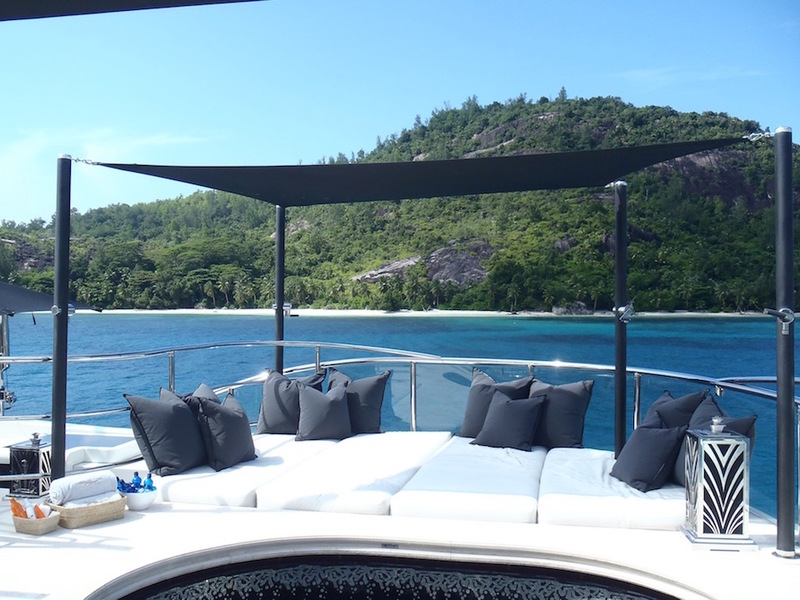 The motor yacht’s ‘loose’ furniture fixtures and fittings have also been fully customized by Argent Design and are ‘one off’ and of exceptionally high quality. 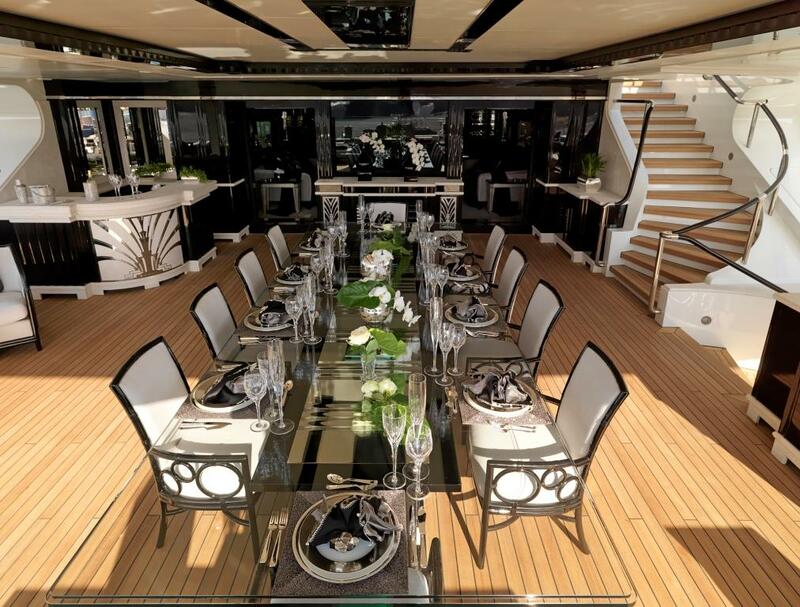 The main entrance to the motor yacht is from the aft deck, via the main saloon and formal open plan dining room, which are both well balanced, spacious and accommodate areas with dining for up to sixteen guests. 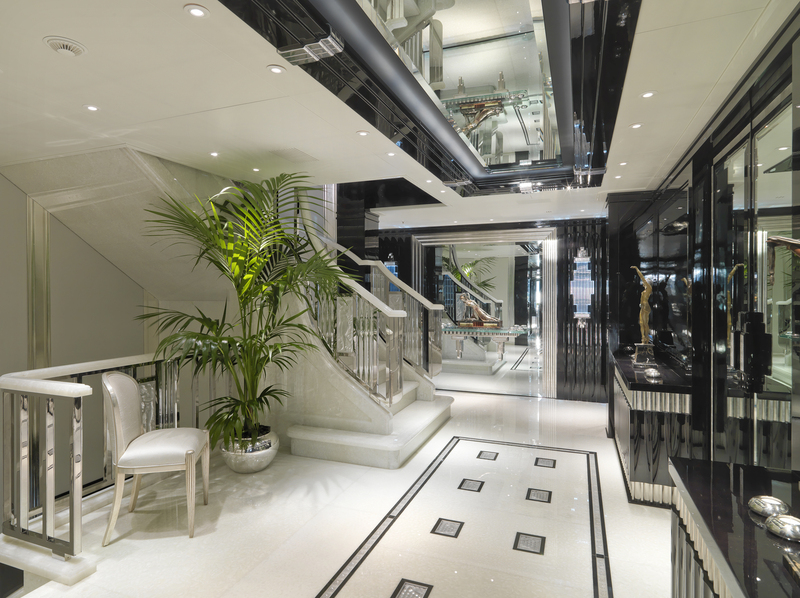 Her main guest lobby beyond connects all three interior decks and has double doors to the starboard side companion way and side boarding entrance. 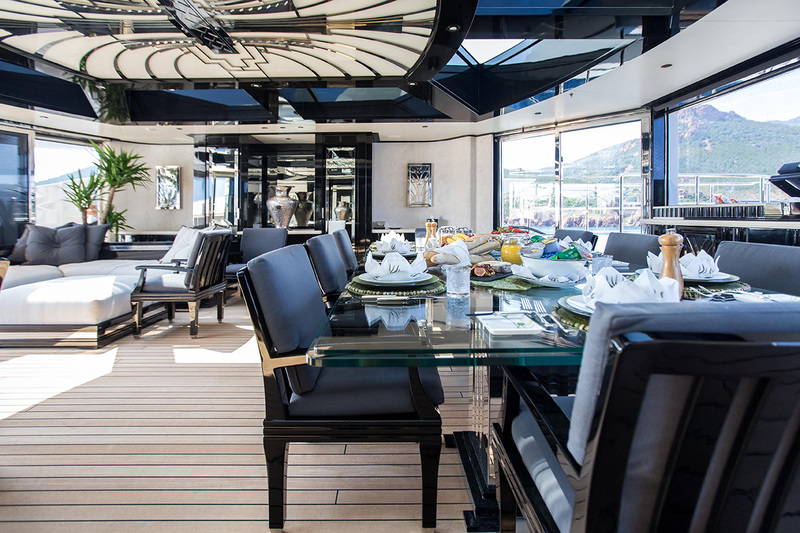 SILVER ANGEL’s large full-width upper deck saloon has double sliding access doors to the expansive external dining area (for up to 16 guests) and beyond. 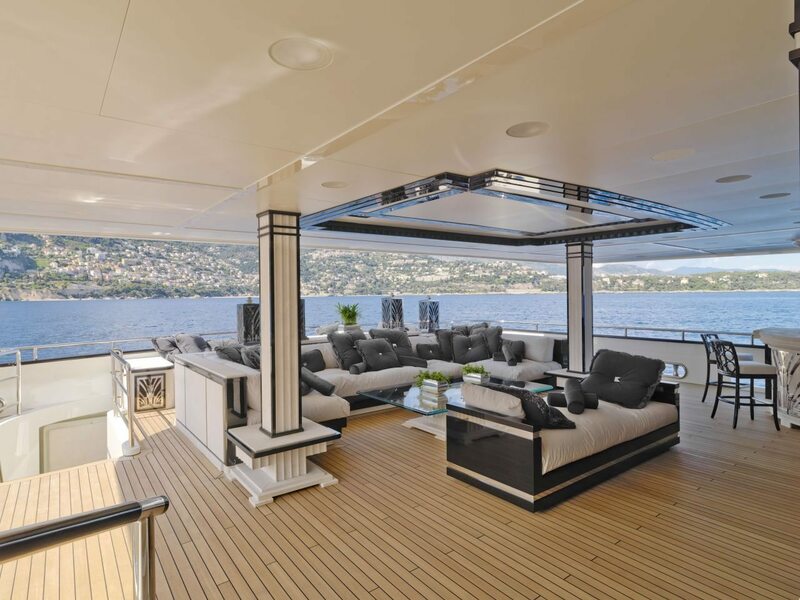 There is a full-width lounging area aft, TV and entertainment systems inside and out, direct access to the Sundeck, main aft deck, swimming platform and guest sports area. 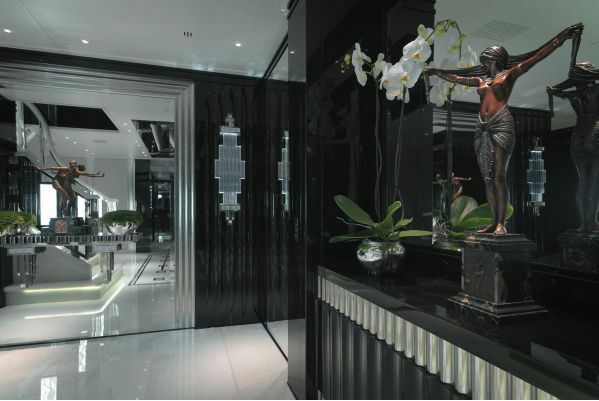 Offering internal and external bars serviced by a large pantry. 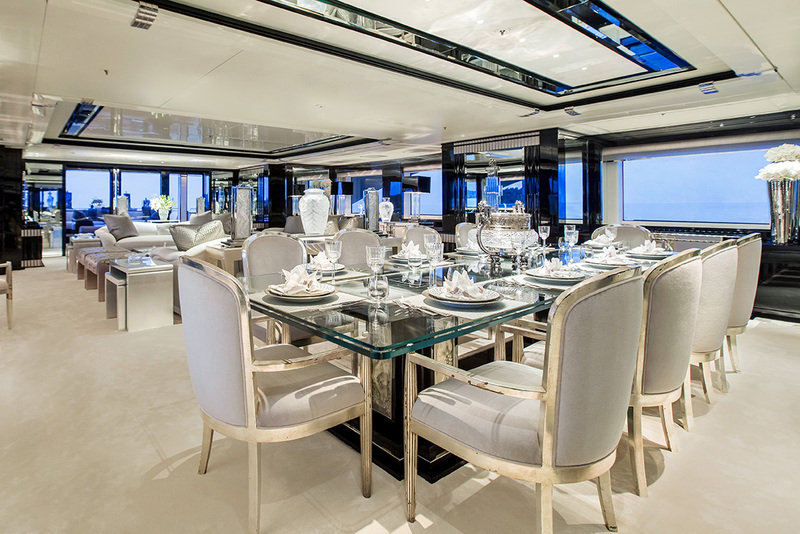 All pantry and service bar areas are connected internally to the galley and crew areas which ensure the most efficient and discrete service throughout. 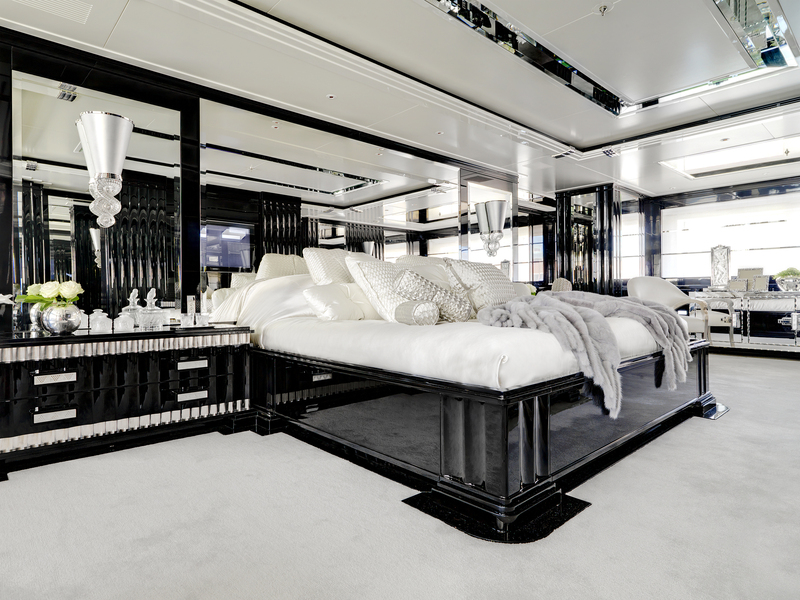 There is comfortable sofa seating for guest’s in the wheelhouse or further forward on deck two large built in lounging beds. 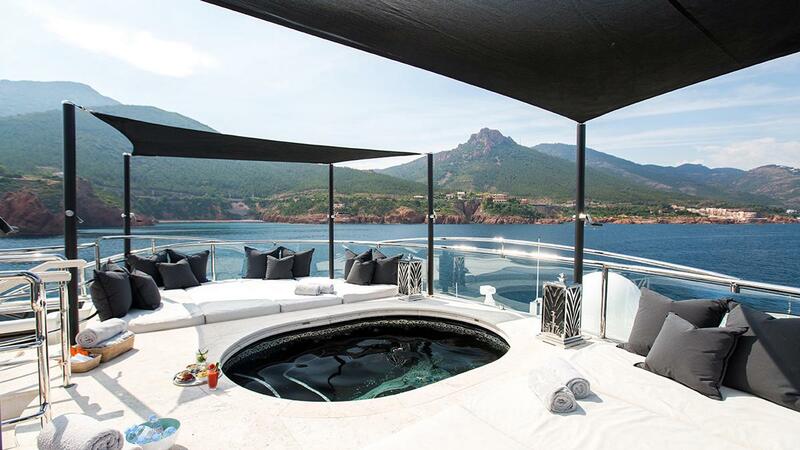 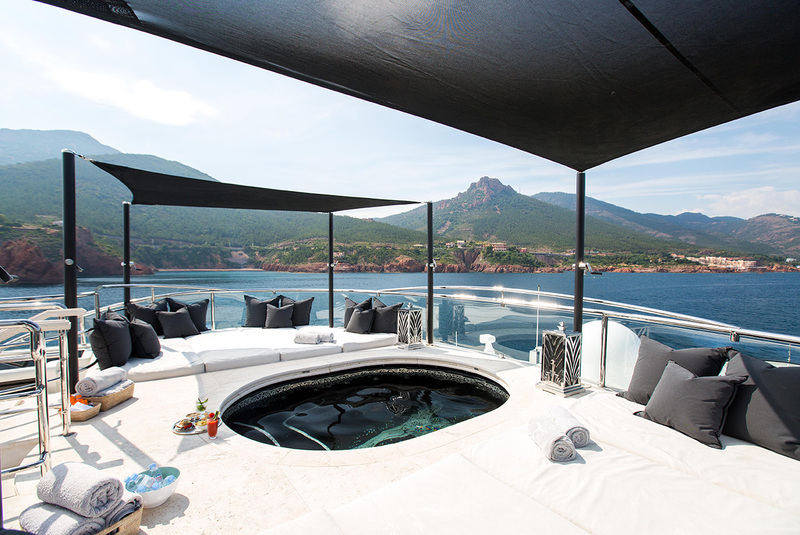 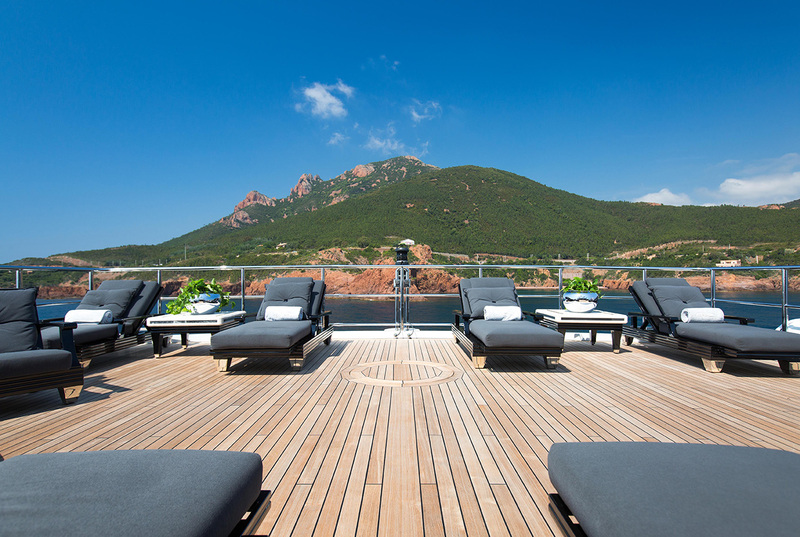 The Sundeck allows all guests an unrivaled experience, with large cushioned lounging around the Mosaique forced jet swimming pool and Spa Pool. 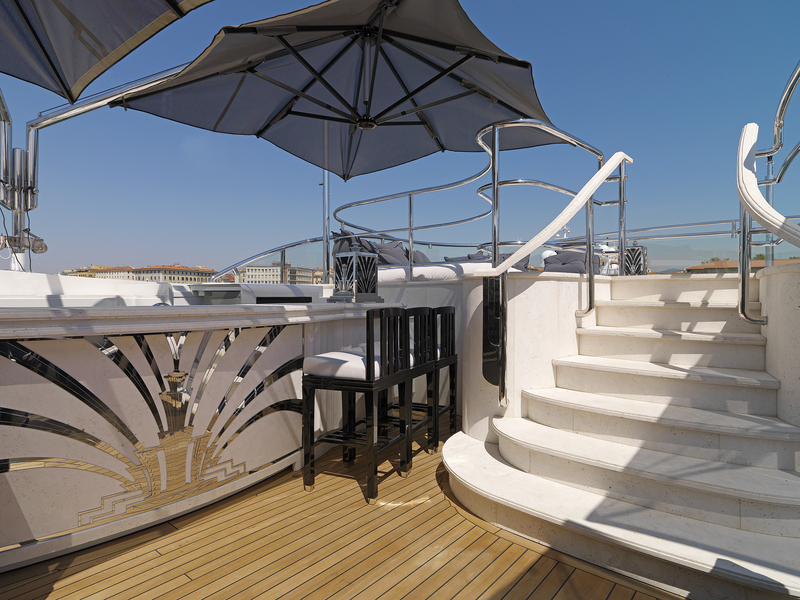 This deck is serviced by a full bar area forward. 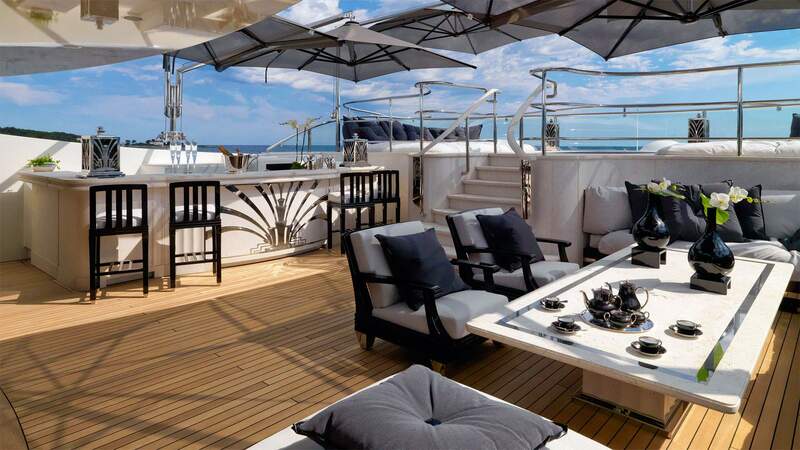 Aft of the air conditioned dining and sky lounge area which can be fully air conditioned or fully open thanks to full-width glass sliding doors fore and aft are independent sun loungers and a fully automatic retractable “TEEIT” golf machine. 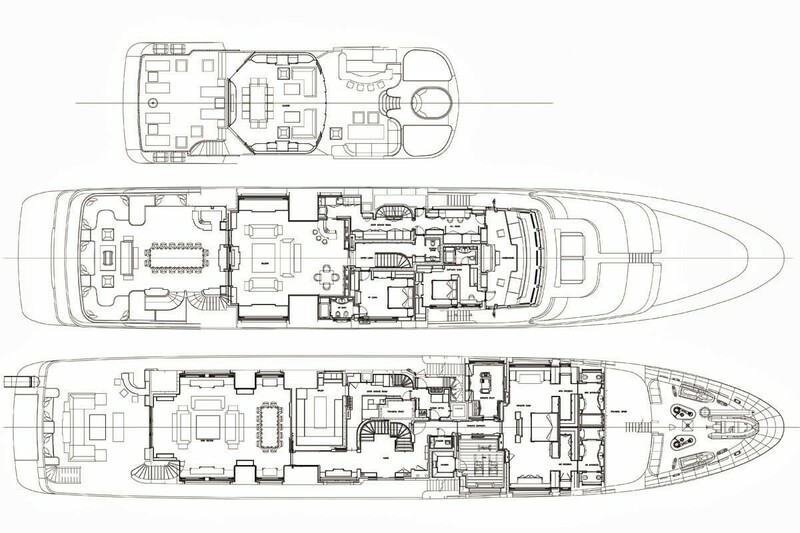 No expense has been spared in the supervision and upgrading of the specification throughout this yachts construction by Benetti, from her machinery to her interior outfit and external details which are all way above the yards standard proposals. 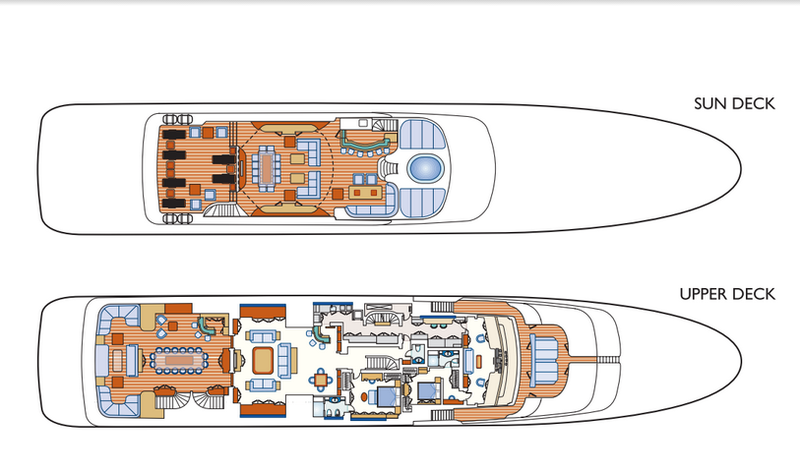 SILVER ANGEL provides superior accommodation for up to 12 yacht guests in 7 roomy ensuite cabins (5 with double beds and 2 with twin beds). 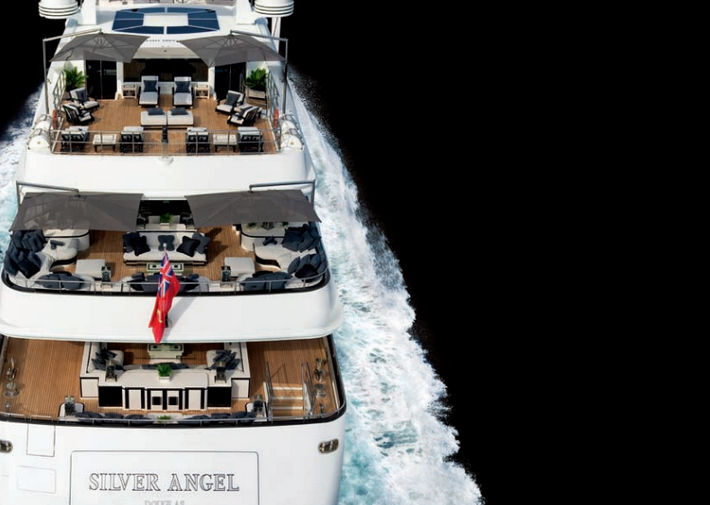 With the uppermost levels of comfort in all areas of the yacht, SILVER ANGEL has been designed and built in mindful consideration to the service operation. 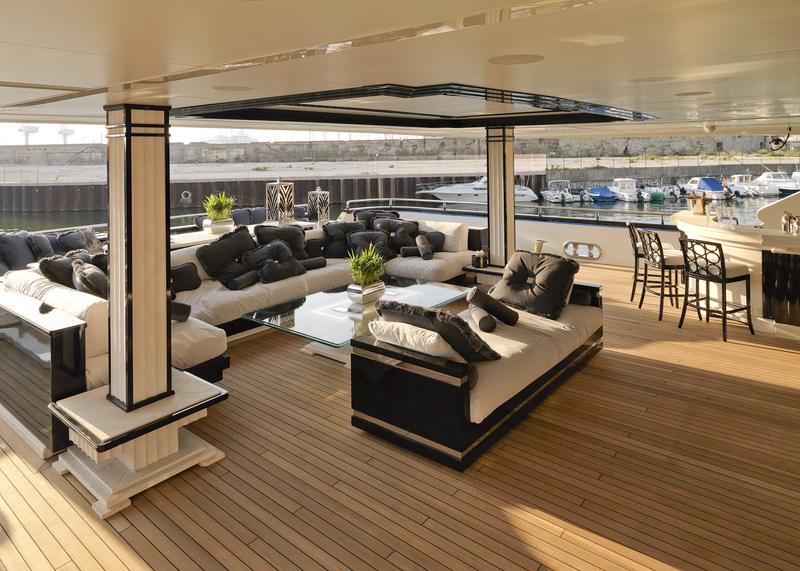 Even her storage requirements are ideal to ensure ultimate service and your maximum comfort and enjoyment. 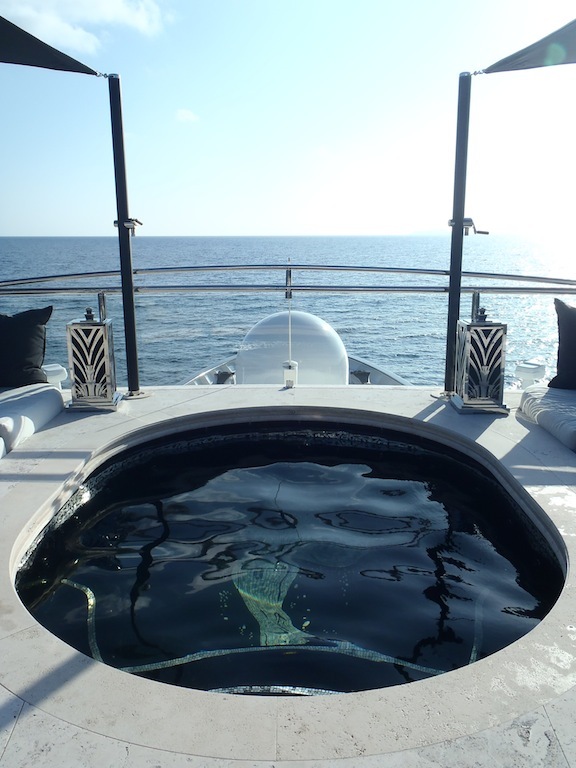 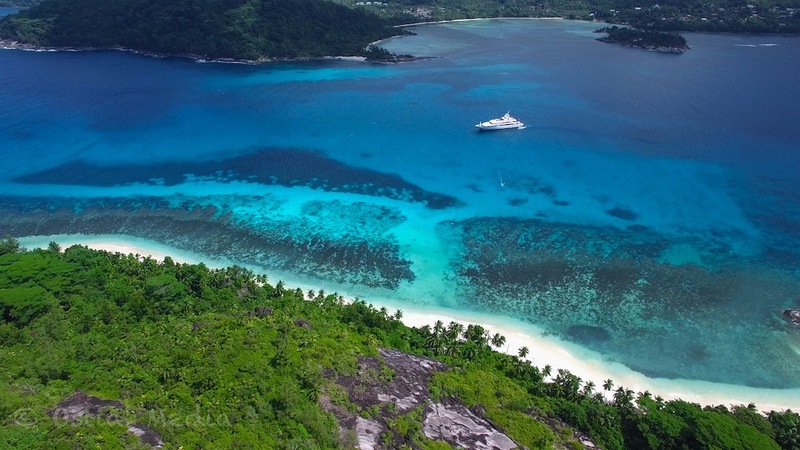 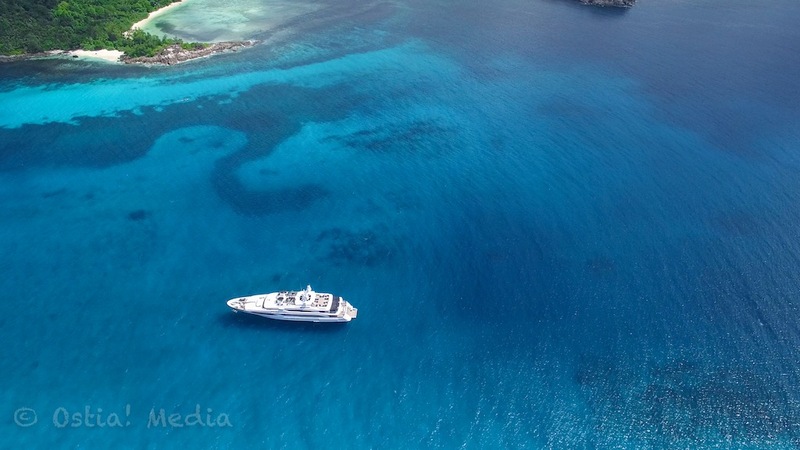 During your vacation, you will be catered for by 19 friendly and professional crew members. 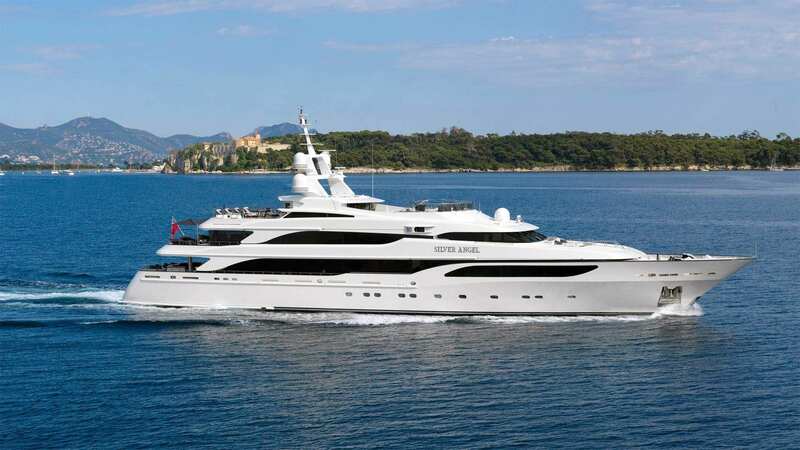 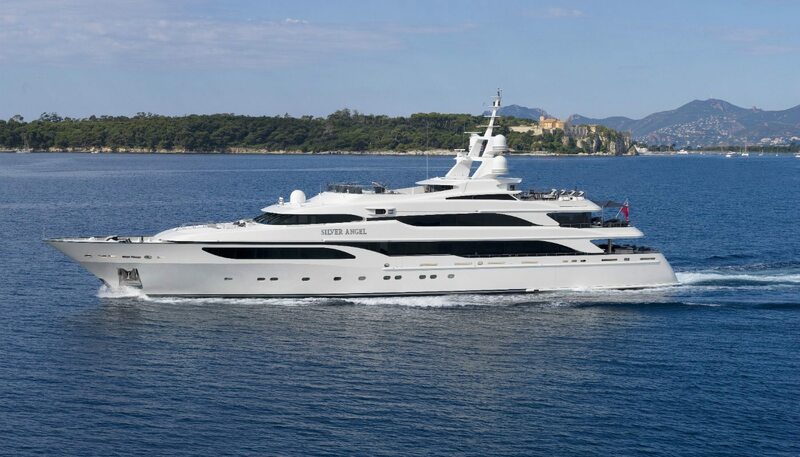 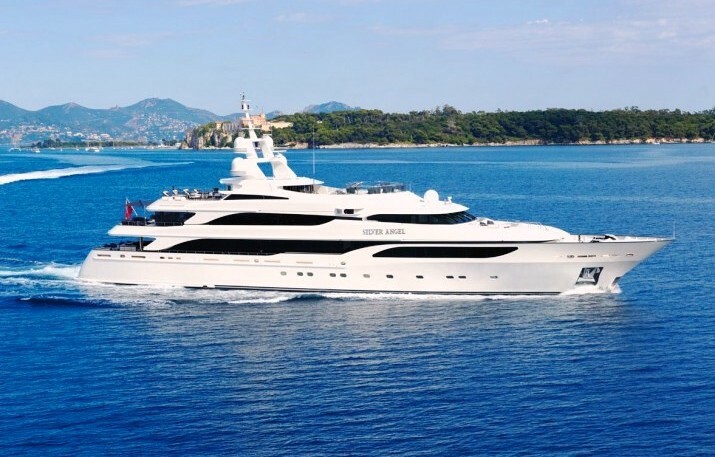 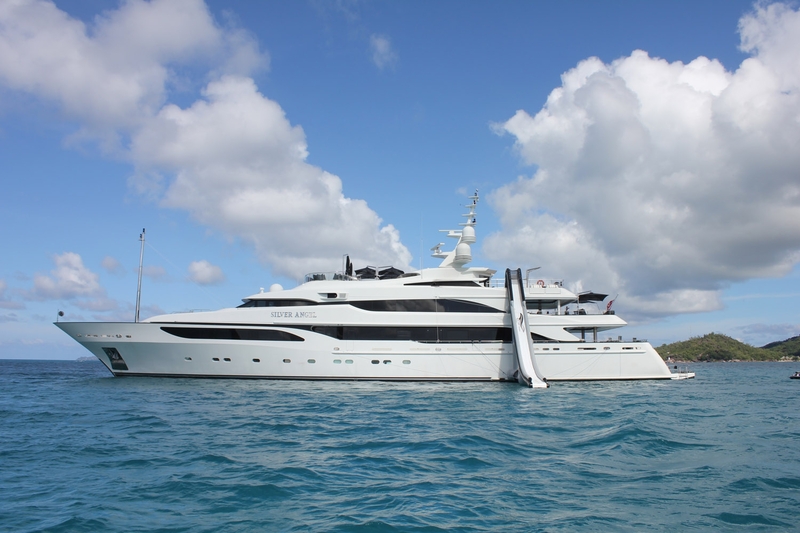 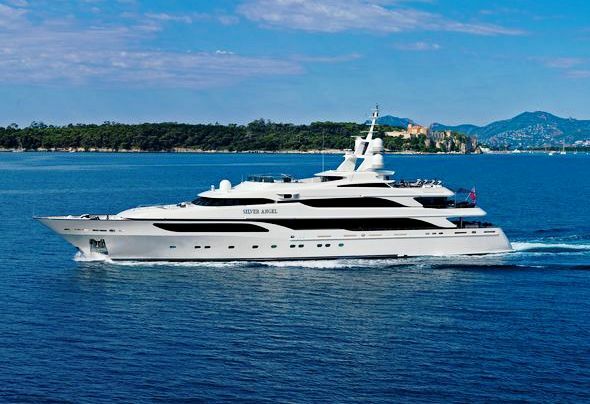 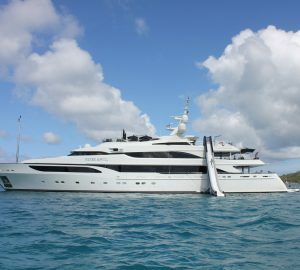 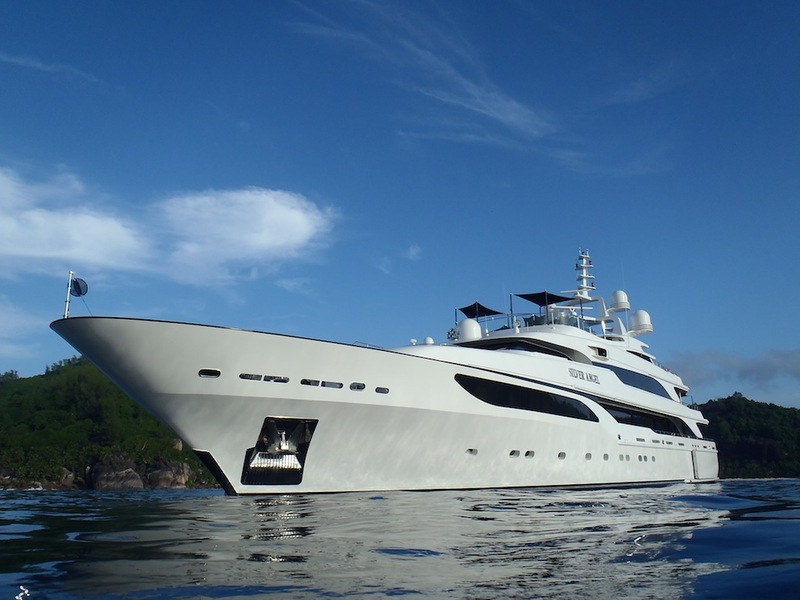 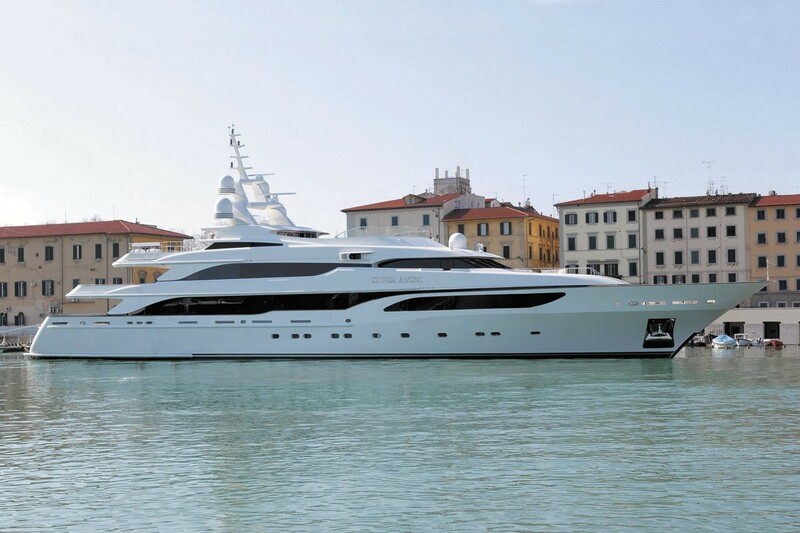 This large Benetti motor yacht is of heavy steel displacement, and she has long range ocean going properties. 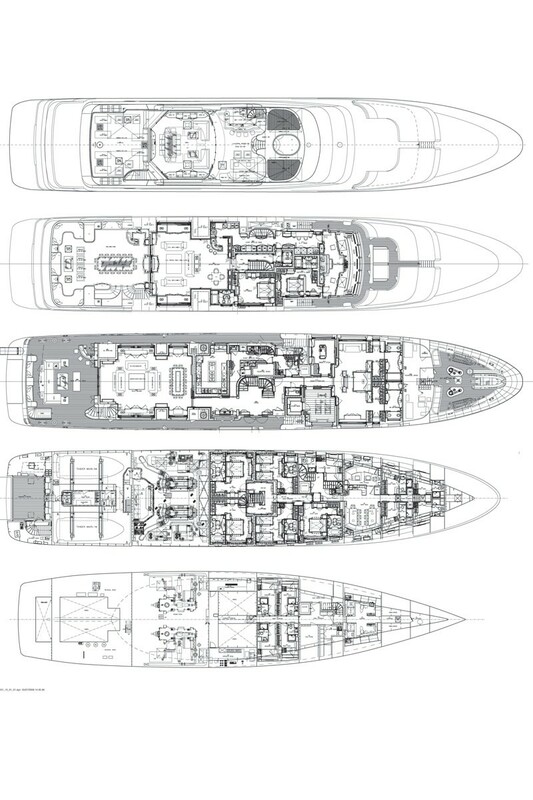 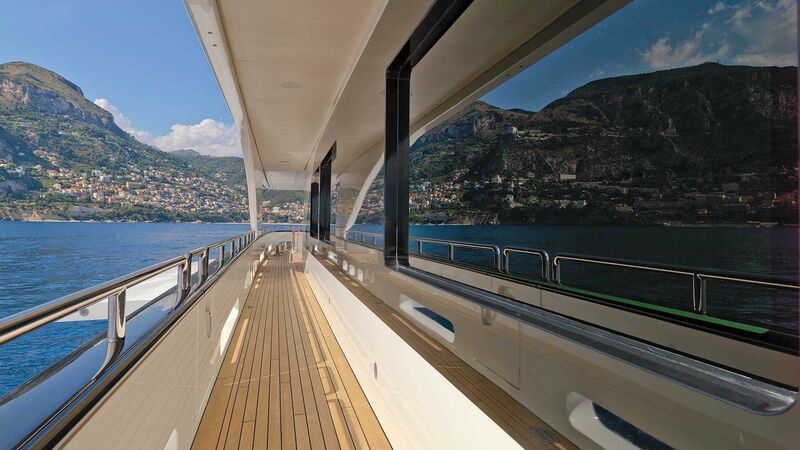 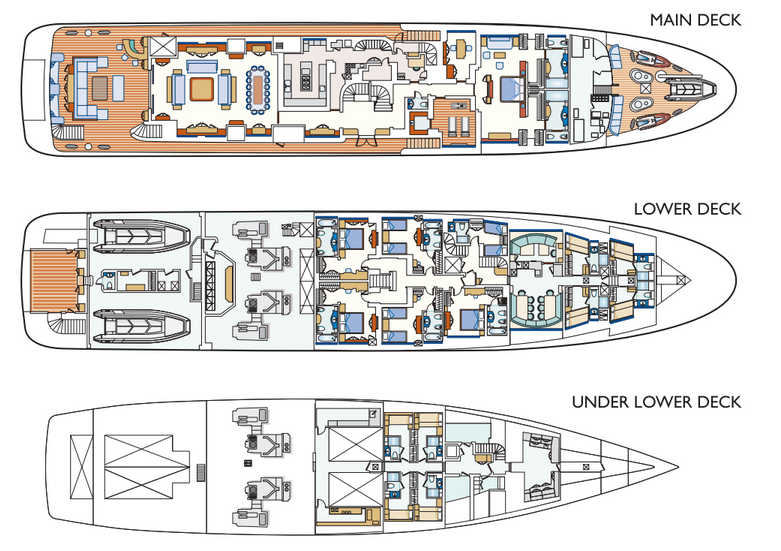 Indeed, she was designed specifically for extensive world cruising in safety and comfort. 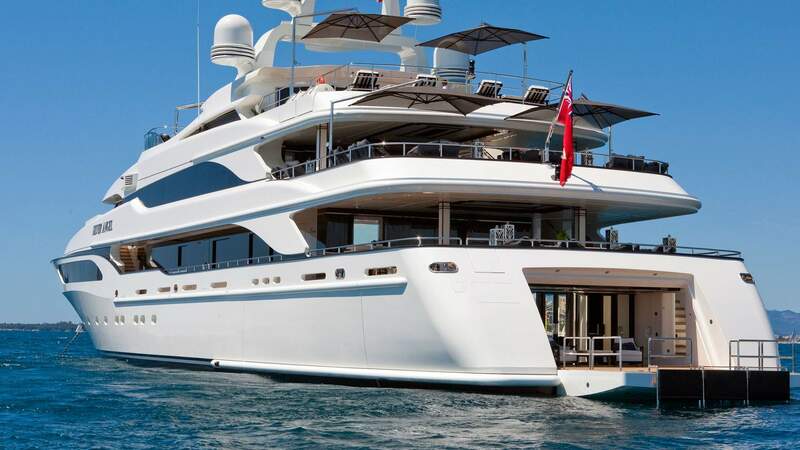 At a staggering 1400 GRT, she is certainly one of the highest volume yachts of her length in existence while maintaining good proportions and sleek profile. 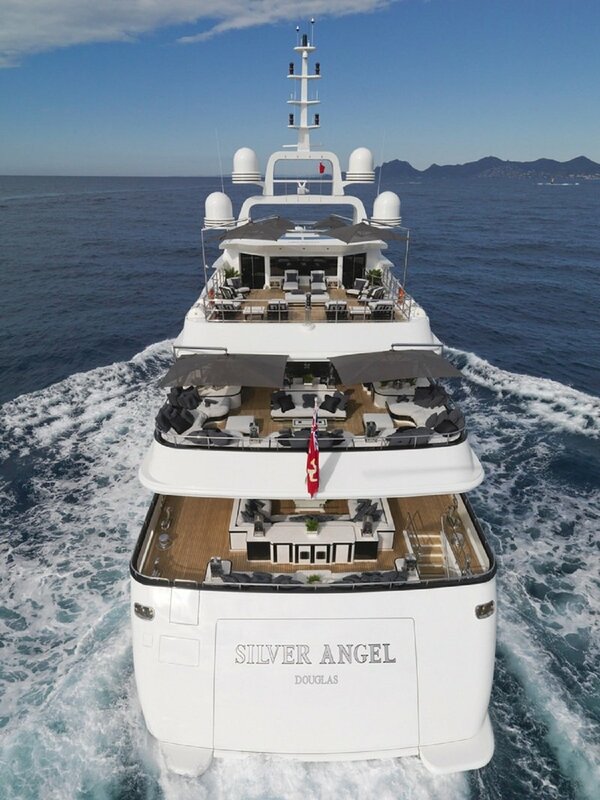 SILVER ANGEL can cruise at a very respectable 15 knots. 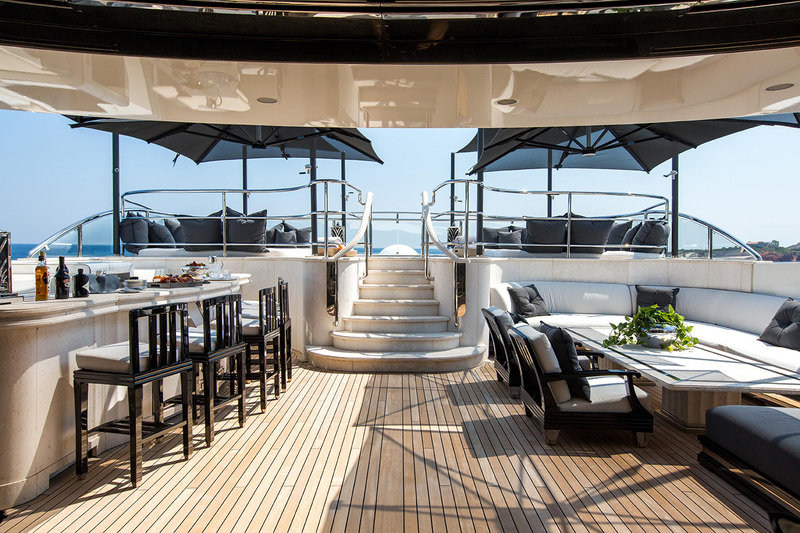 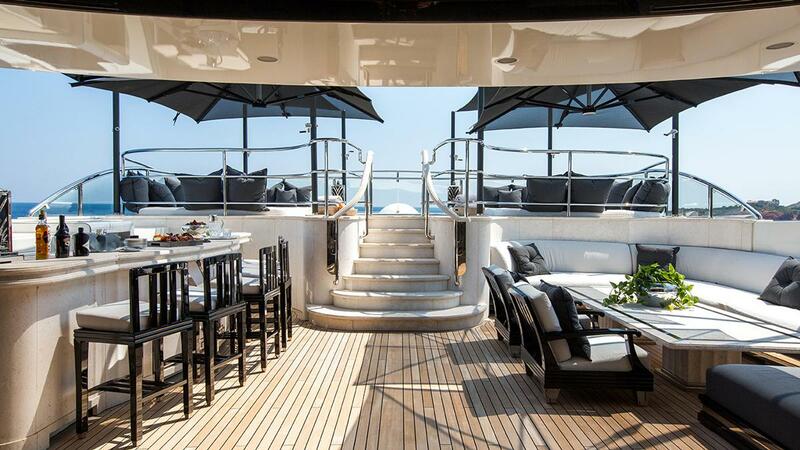 Upon boarding SILVER ANGEL her main deck aft offers a vast seating area with a full bar and direct access to and from the swimming platform, tender garages, and water sports equipment. 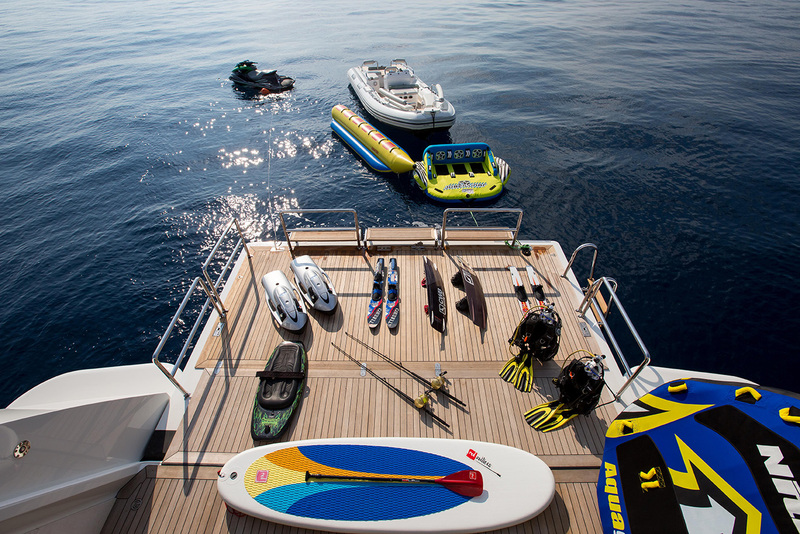 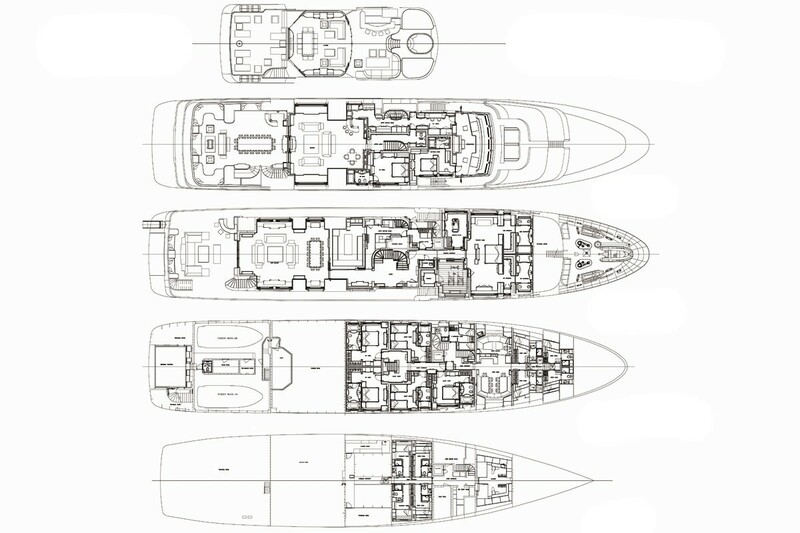 Two custom built 7.5m tenders are stored in separate garages port and starboard, along with a complete array of water sports toys and an extensive range of diving gear with a dedicated dive store room. 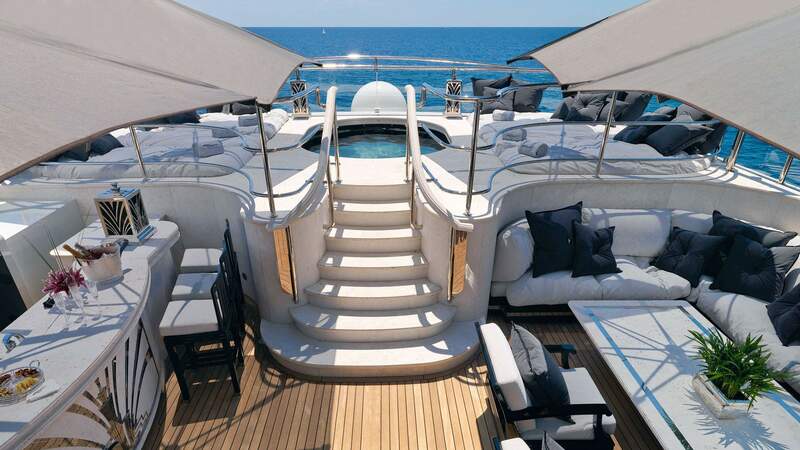 Indeed, amenities, water toys, and deck space are all of the highest caliber, which is important in a superior luxury yacht. 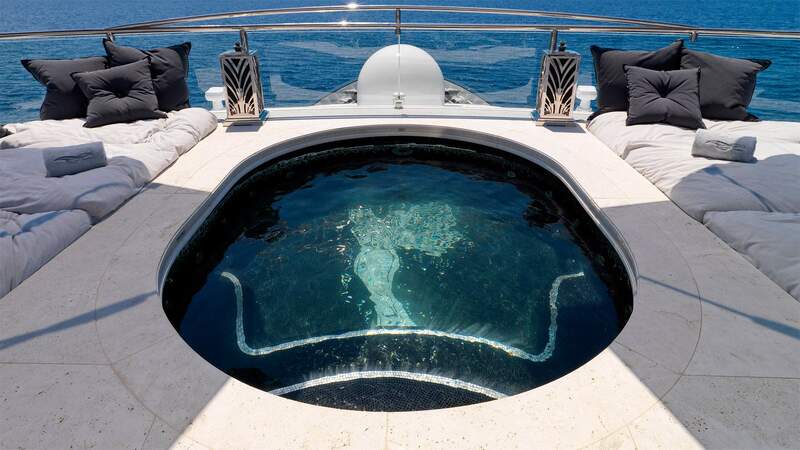 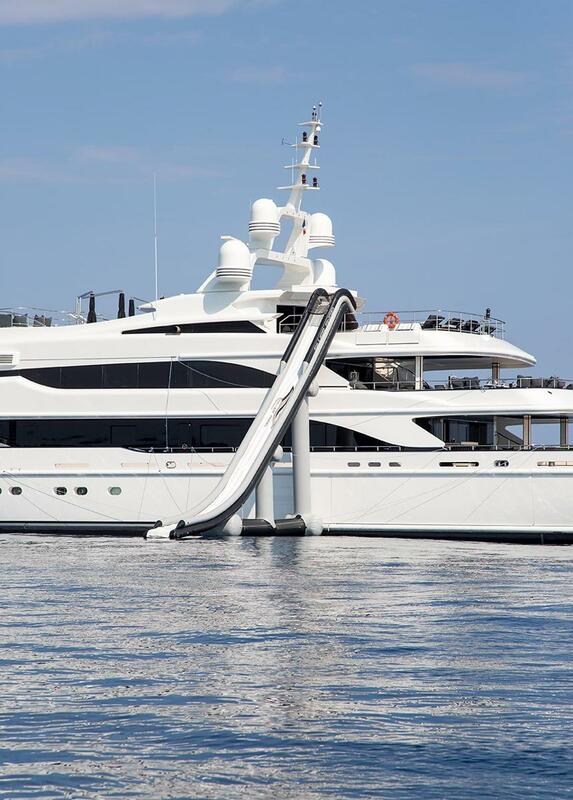 The list of toys includes a Boesch 7.5m classic mahogany fully customized speed boat, 16 sets diving equipment, a 7.5m Novurania tender fully customized semi rigid with diesel inboard dive tender and a huge sun deck which hosts the golf machine and the Spa Pool pool. 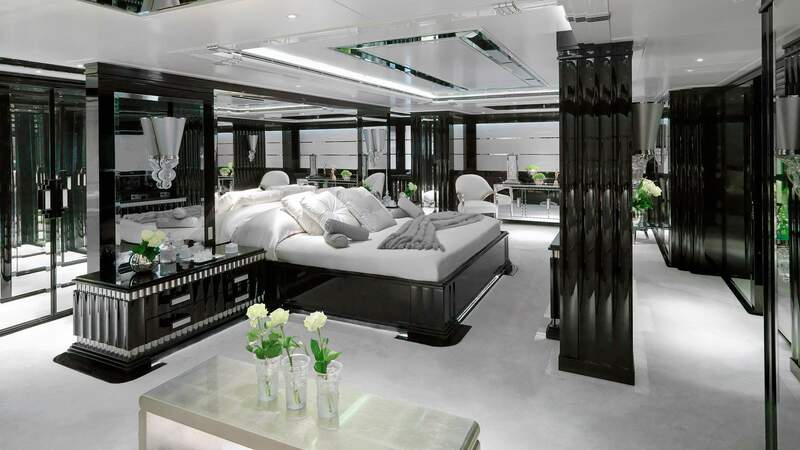 Below deck there are three double cabins and two twin cabins which are all forward of the engine room which is an extremely quiet part of the yacht. 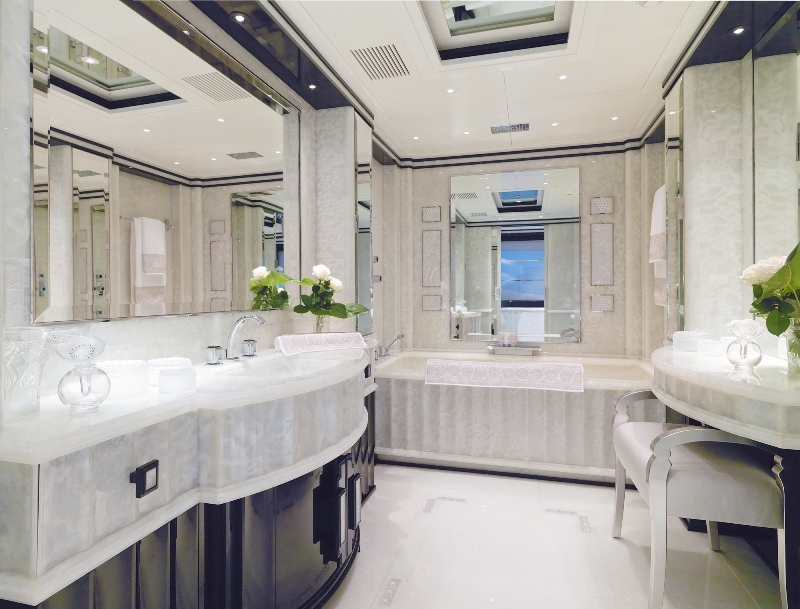 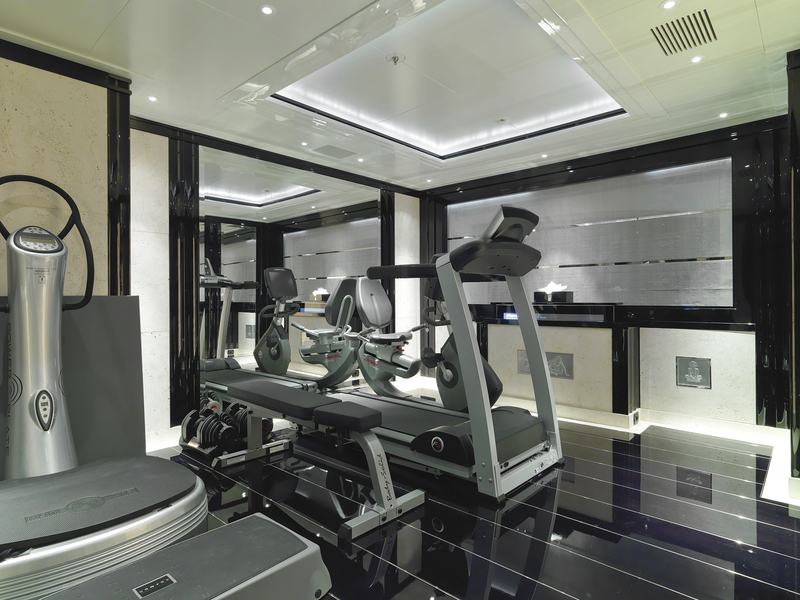 These cabins have a direct service access from the crew areas for discreet service. 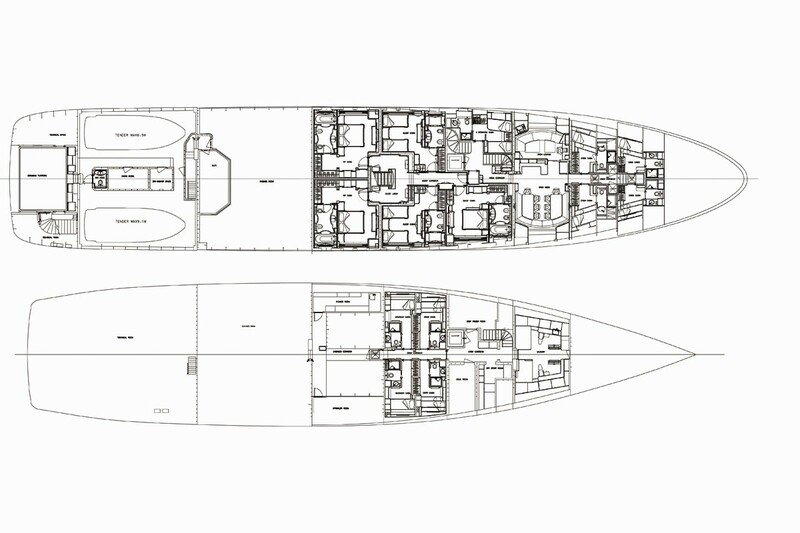 There is a further double cabin/V.I.P. 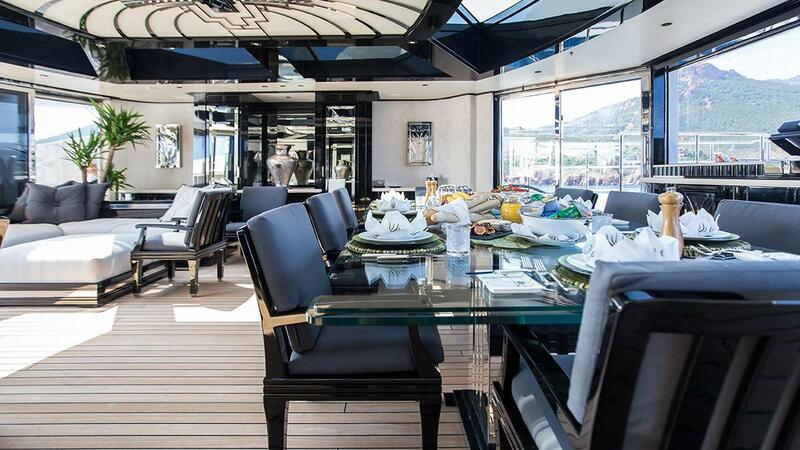 on the bridge deck adjacent to the upper deck saloon and bar which also has its own ensuite.